Il Best Western Huntington Mall Inn è situato nel centro di Barboursville. L'hotel è vicino alle principali attrazioni turistiche. Approfittate tutto l'anno del miglior prezzo garantito e di offerte esclusive. 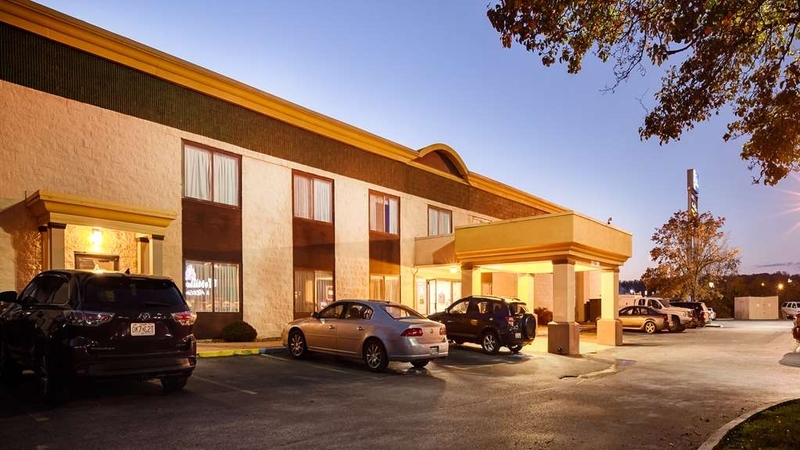 Il BEST WESTERN Huntington Mall Inn è situato in posizione ideale nei pressi dell'Interstate 64, a pochi passi da numerosi ristoranti e a pochi minuti dal centro commerciale di Huntington. Gli ospiti che si trovano in città in occasione di un evento alla Marshall University, che si tratti di una cerimonia di laurea o di un fine settimana di trasloco, si sentiranno come a casa durante il loro soggiorno nel nostro hotel di Huntington. Gli studenti, le loro famiglie e i docenti in trasferta fanno affidamento sul nostro hotel, sapendo che offriamo il miglior servizio in città. In questa regione c'è anche la Blenko Glass, uno delle ultime fabbriche di vetro soffiato degli Stati Uniti e un'attrazione davvero imperdibile. La nostra priorità assoluta è la comodità dei nostri ospiti, per questo offriamo accesso gratuito a Internet ad alta velocità e camere fumatori e non fumatori. Nel nostro hotel sono ammessi animali domestici: pagando un piccolo supplemento potrai portare con te il tuo amico a quattro zampe. La piscina all'aperto del nostro hotel di Barboursville è il luogo migliore in cui rilassarsi e riposarsi dopo una giornata passata a fare shopping o a esplorare la regione. Molti ospiti soggiornano nel nostro hotel di Huntington per assistere agli eventi sportivi dell'Università, per questo ospitiamo spesso anche squadre sportive. Se sei in città per recarti al casinò e ippodromo Mardi Gras, questa emozionante attrazione si trova a una breve distanza d'auto dall'hotel. Ci troviamo in posizione comoda rispetto ai negozi, a pochi passi dall'Outback Steakhouse e un chilometro e mezzo circa da ben 17 altri ristoranti. I gruppi che partecipano ai tornei giovanili amano soggiornare da noi soprattutto per via dei nostri ottimi prezzi e del popcorn gratuito servito presso la hall. Nelle vicinanze vi è anche il parco divertimenti Billy Bob’s Wonderland, la meta perfetta perle famiglie. Il Barboursville Park offre tutte le bellezze di Madre Natura. Fai una gita al parco per approfittare dei suoi magnifici spazi aperti e per fare un barbecue durante l'estate. I pazienti che si trovano nella regione per recarsi al Veterans Administration Hospital sanno di poter contare su di noi: offriamo un ottimo servizio clienti e sistemazioni spaziose. Approfitta delle nostre fantastiche tariffe e prenota subito una camera al Best Western® Huntington Mall Inn! Ti auguriamo un soggiorno gradevole! "Repeat Guest - for a reason"
This is our second visit to this property. There is a reason why - good location for day trips for the west side of our mountaineer state. Property is clean and they have an OUTSTANDING breakfast (e.g., eggs, bacon, biscuits, yogurts, waffles, cheese, fruit, plus all the "standard" items). Staff is very friendly too. Price is very reasonable and even with being next to the interstate, one doesn't hear that traffic. BW, give yourself a pat from this loyal guest. Reserved at discount through Priceline. Our first room had a stopped-up sink. It drained extremely slowly, at a trickle. One of the floor tiles was broken out in the bathroom (did not take photo). We were immediately issued another room, the plumbing issue would be reported to maintenance. There was a very strong, undesirable odor when we walked into the second room and noticed wrinkled sheets and bedcover. (That could have been from being left in the dryer too long.) We were immediately issued a third room, which we found comfortable and acceptable. The receptionist was very friendly, helpful, apologetic, and addressed our concerns without delay. Good man! I read all the negative reviews and doubted about staying here. But I was wrong. This is a great hotel. My wife has MS and I requested a ground floor handicap accessible room and was given room 114 right off the lobby. Loved it. The room was fresh, clean and looked as if it had been recently remodeled. The bed was good, and the room and bathroom was clean. No problems whatsoever. The only thing I wondered about was if it is handicap accessible, why did it have a tub instead of a walk-in shower? It didn't matter to us, but I wondered about if someone had a wheelchair. The lobby was always clean and you could smell the freshness when you walked in the front door. The breakfast was good. Eggs, sausage, and biscuits and gravy. Plus many other food items. The only thing I didn't like was the entrance to the hotel was potholed. But, it shared a drive with a strip mall, so there is a lot of traffic. Outback steakhouse is right beside it, and within walking distance are Steak-n-Shake, Fat Patties, and across the street - Cracker Barrel. Will definitely stay here again. Thank you so much for your business and feedback. I am happy to hear you and your wife enjoyed your stay. We do have two types of handicap rooms. The other type does have a roll in shower. Thank you. The is my second time at the Best Western Huntington Mall. Clean room, good service and price was great compared to others in the area. 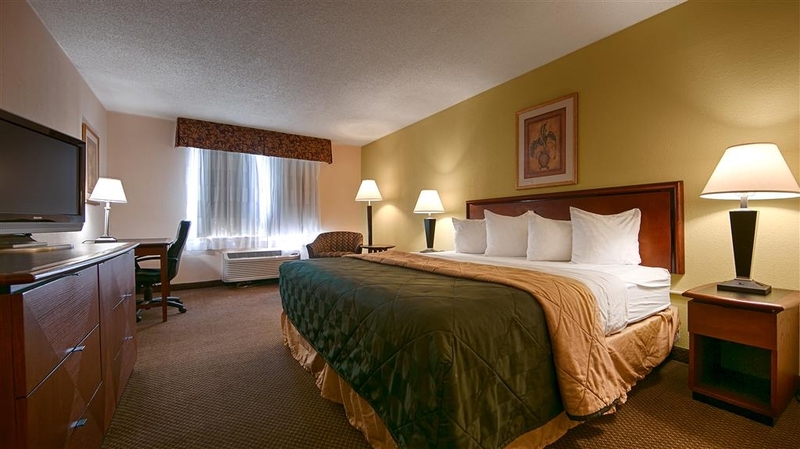 Conveniently located to shopping, restaurants and close to events down town. 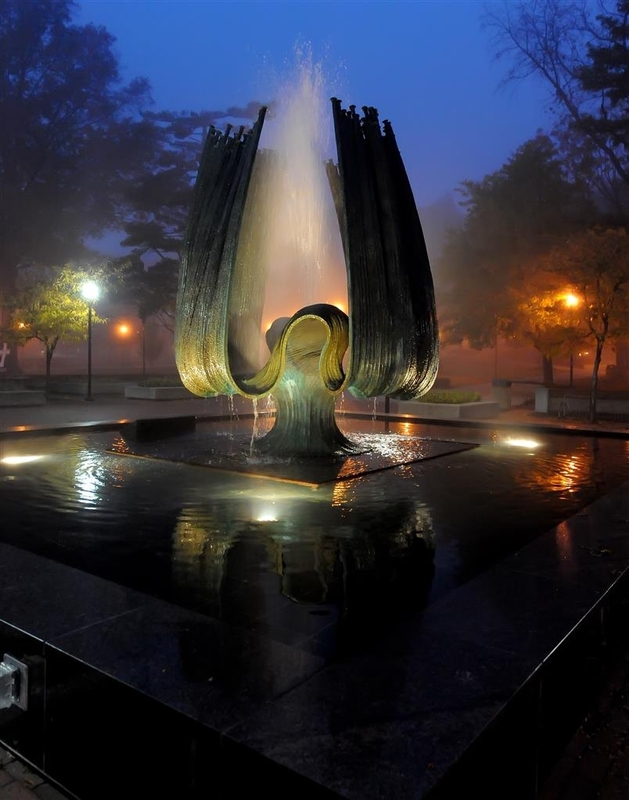 My husband and I have stayed here twice will visiting our son while he attended Marshall University. This hotel is really out dated. The beds were comfortable and the staff are very pleasant. Breakfast was okay. Settled in to bed at the end of a long day to find it crawling with bed bugs. After squashing two and spotting a third on top of the comforter, I checked out immediately. Since then, I've found a bedbug on my leather purse. At the airport more that 16 hours later, I spotted a bedbug in a crevice of my backpack. I have bites on my knee, ankle, neck and back - and that was after just 15 minutes in bed. I am very sorry for your experience. I know we had since spoke about this on the phone. Again, I am very sorry. "Great Stay for State Wrestling Tournament"
our Family of 5 had to come to Huntington for the state Wrestling Tournament with our 3 kiddos (ages 8-12). Everyone we encountered at the BW was kind, courteous and very accommodating. I utilized the exercise room daily and the machines were in great working condition. It would be nice to maybe add a yoga ball, a mat and maybe some bands or free weights (though I realize some with sticky fingers will be inclined to take these items, sadly). The breakfast was great; we have three in our family who can't eat gluten and there were plenty of options for them as well. The only thing that would have made our stay better was having an indoor pool, which cant be helped in the location BW is in. But everything else was great for our quickly family getaway! This hotel is in a great location. Close to interstate, the mall, and gas station. Friendly, helpful staff. Check in went smoothly and quickly. Reception area very welcoming. Room was nice and tidy. Hotel has a small fitness area. Checkin was quick, rooms were clean and quiet, and the coffee was good! Front desk was incredibly accommodating, especially for my party's incredibly late checkin. Best sleep I've gotten in some time. Can't beat it! This hotel was by far one of the dirtiest I've ever been in and I travel often for both work and pleasure. My entire family was in town for my grandfather's funeral and spent 3 nights here...I believe it was 7 rooms. We read the reviews and most were good...and the price was great so we booked. The smell in the hallways (old/dirty/smoky) was terrible, although the room smell wasn't quite as bad. The rooms were dirty as if they hadn't been swept in months especially around the walls and under things. We found multiple items in our combination of rooms. Everything from a pair of dirty socks under the edge of the bed in my sisters room to a rotten potato under the air unit in ours. There were sharp beer caps and change around the floor as well in several of them. The Breakfast was good for the most part with plenty of options and the staff was incredibly friendly....so that was a plus. We did inform the desk clerk and he mentioned that they would let the housekeeping staff know about our room, but it was clearly not just any one room. We all considered leaving but at such a stressful time, we didn't want to have to pack everyone and everything up and move somewhere else. Lack of maintenance was clear as well as there was a piece of trim sticking out of the wall with sharp staples pointed out and something spilled and tracked all over the entrance at the lower level (Door C, I believe). This particular hotel needs a major overhaul all-around...however, the wet paint signs should probably be left up until it is actually completely dry. I will not be recommending this particular Best Western in the future. Everyone helpful, friendly, and made stay easy and enjoyable. Ease access from interstate, pleany of restaurants within walking distance, and nice amentities. Breakfast selection was excellent and plentiful. Thank you. I am glad you enjoyed your stay during your trip. Might be tied for the dirtiest hotel room I've ever stayed in. The breakfast is meh, the coffee was like brown water. The sheets are awful. We arrived late with kids and a dog or I definitely would have found somewhere else to go. Life is too short. "Good for the Much Better Price"
Other hotels near by (one of which we really like and used last year for a large group weekend) cost nearly twice as much as this one. It is not as fresh as some in hallways and outside, but no complaints about room especially at about $70 less than Hampton and Holiday. Hotel was clean and for the most part, comfortable.We were not too thrilled about the breakfast. Slight oder in the hallway. But not overpowering. Over all quiet. The room was very clean and climate controls easy to operate. I must admit, I didn't have high expectations of our stay here when attending a Regional soccer tournament. This place met my expectations and then some. It was overall a clean hotel, rooms were adequate in size and my stay was comfortable. They had a nice room our team was able to rent as well for a team dinner. The staff was easy to deal with as well. I would definitely stay here if in the area. Thank you. I am glad you enjoyed your stay. After traveling for several weeks, we have had all sorts of hotel experiences. This Best Western was one of the best. The room was bright, which seems to be unusual lately; it was relatively large; it had a refrigerator with a freezer; and it had a microwave. Everything in the room worked fine. It was clean. The shower was fabulous with great water pressure. The breakfast was fine, typical of hotel breakfasts. We would definitely stay here again. Thank you. I am happy you enjoyed everything. "Two nights in Best Western"
I stayed here for two nights - once going to Virginia Beach and once coming from Virginia Beach. The first night was in an even numbered room which seemed to be quieter than on the way back when I stayed in an odd numbered room. The daily breakfasts were good. Pepsi products in the vending machines! Staff was friendly; rooms were clean. Thank you so much. I am glad you enjoyed your stay. "Nice location, reasonable rates but no elevator." So, what's the big deal about a second floor room without an elevator? Not much for an overnight but when you stay more nights, need more gear to the room... a bit different. To their credit, the desk clerk volunteered to help carry things up and stepped up to help. We had a convenient 2nd floor room near stairs and the INOPERATVE ice machine. OK, another ice machine on level 1, just beneath the INOP level 2. The air filters on the first floor ice machine were filthy, mostly clogged and maybe... the reason the 2nd floor machine in inop with similar lack of attention. It took me less than a minute to pull the filters, bang them off and reinstall. Housekeeping could do this with a vacuum in even less time, and they should! Our room is a king with sleeper sofa. Plenty of room with microwave, fridge, and the rest. Right now, we'd come back. this was a good option for us on our way back home from Williamsburg Va. . the place was clean handy to many eateries. after making reservations we found reduced rates available online and saved $30 . I am very sorry for the problems you had. Thank you for your feedback. This place is ok for the money, but it sure does need a lot of help. Every room and every part of this hotel needs new paint, new. Carpet and to become an all NO SMOKING hotel. The smell was horrible and very offensive. We were attending a funeral and all of our clothes smelled like cigarette smoke just from hanging in the hotel room. They also need an elevator. But for the money it was merely a place to lay our head at night. We will be staying at a different hotel next time. I am very sorry for the issues you had. I understand the smoke smell can be difficult. We try to keep the smell in the smoking section. Thank you for your feedback. The rooms were clean and comfortable. Nothing fancy but served the purpose of a good nights rest. It was well located near the mall, making it convenient for shopping and food options. It was also quite close to Huntington where I had meetings. Easy on and off the highway. I am very sorry about the change in rate. I would be more than happy to look into this for you. The motel is located near 2 restaurants and high traffic. Sometimes hard to get in and out.The parking is limited with a number of workers here right now.The room is nice with micro/refrigerator and coffee maker. The only good thing about this place was location. Our room was not comfortable, scratch sheets, a phone that did not work, tiles coming off the bathroom wall. There is more, but you get the general idea. I am very sorry for the problems you had during your stay. I wish we could have fixed these issues for you during your stay. Your goal is to provide each guest with a great experience. I am very sorry of the inconvenience. Found bed bugs in room 213. The attendant didn't seem at all surprised that there were bed bugs in the hotel. He couldn't figure out to show a zero balance on the invoice, so hopefully that is correct. He also was filthy. The breakfast food was nasty as was the coffee. The public restrooms were not clean. This was the worst hotel stay I have ever had. I am very sorry for the issues you had. I understand how upsetting this would be during a trip. I have checked to make sue nothing was charged to your card. Again, I am very sorry. The only good thing I can say is the breakfast is adequate and the employee keeping the breakfast going was the only friendly employee we came across. When we checked in we had to wait at least 5 minutes for someone to come to the front desk. After my husband loaded our luggage on the cart we discovered on our own that there was no elevator. The employee at the front desk then told us where the stairs were located. The stairway along with the rest of the hotel is long overdo for a makeover. Once we got in our room we continued to be disappointed. You could see the dirt and dust along the edge of the carpet and it was obvious that it had not been vacuumed in quite some time. The wall where the iron is was dirty. Thankfully the bathroom was clean however it is very small. Had the bed not been clean as well we would have left. We were not going to be in our room much and figured from the shape the hotel is in that had we requested to be moved that room would have been the same. When we checked out this morning the front desk clerk didn't have much to say and never asked how our stay was. So if you can afford to spend a little more on a hotel room much suggestion would be to do so and stay somewhere else. I am very sorry that the room was not up to standard for your stay. I understand this would be difficult during your stay. I wish we could have fix these issues for you during your stay. Again, I am very sorry. "Thanks again Barboursville Best Western!" Once again found myself and my friends running through beautiful West Virginia and made it a point to make a stay at the Best Western Huntington Mall in Barboursville. 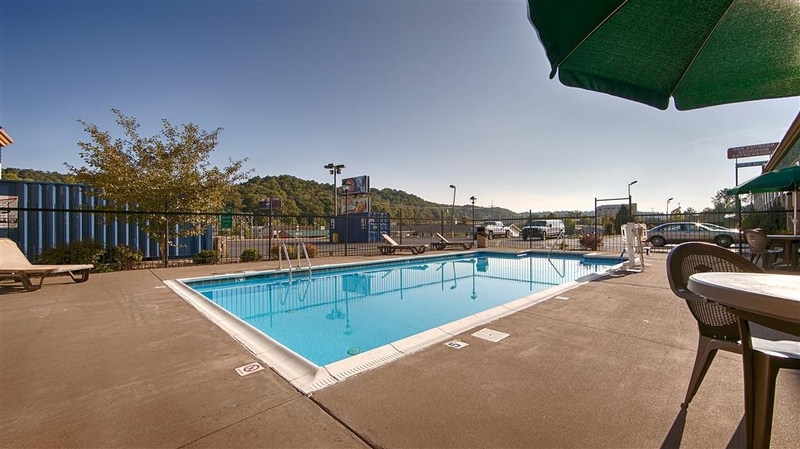 Located conveniently off of Route 60 and highway 64, this best western is a great stay if you're ever running through the Huntington/Barboursville area. Great, friendly staff, clean rooms, great beds and pristine bathrooms. There are various restaurants, bars and stores in the area within walking distance and a fabulous continental breakfast. A very relaxing pool, a fitness center and a business center in the wonderful cozy front lounge. Do yourself a favor and hit this place up if you're traveling through. Great! I am glad you enjoyed everything. We look forward to having you stay again. You get what you pay for. This place is a good value but don't be swayed, as I was, by the reviews of good cleanliness and wonder of this motel. It is not that clean. It is a property old beyond its time. The room was fine and I didn't get murdered or anything so it is a fine place to stay but it is not as nice as the Hampton Inn nearby. Definitely on the lower end of the spectrum but staff was nice and it was clean enough if you want to save some money. Go for it!! Thank you for staying with us and for your business. It is a very safe area of town to stay. We travel a lot and for the price it's a pretty darn good deal. Staff is friendly, breakfast is decent, pool is clean. Stayed multiple days, no issues- except parking is a bit cramped to do all of the large work vehicles (no biggie). Busy hotel with good value and adequate breakfast bar. Rooms comfortable...staff excellent! Several restaurants nearby and near cities and Marshall University...parking is free...only cmplaint is no elevator to second floor. Room quality vs $$. It is adequate. However, primarily occupied by local construction crews and drug activity which is veey dangerous- not to mention illegal!! Felt very unsafe and unruly behavior such as running up down halls and excessive noise and could not rest well. No elevator to 2nd floor. A/C does not work well. Do not stay if with a family! "Very Nice Hotel East of Huntington"
The Best Western is a nice place to stay if you are visiting the Huntington area. It's about 10 miles east of the downtown area and an easy drive. The front desk clerk was very friendly and helped get us checked in quickly. Our room had 2 beds and they were clean and comfortable. The linens are nice too. The hotel sits in the parking lot of a mall, which seems odd, but really isn't. There's plenty of safe parking too. This hotel is recommended for sure! This is a value hotel designed to save you money. That said they are also a reasonable choice if you want a nice place to stay that has all the basics plus a few extras. The outdoor pool was pleasing to many of the kids and families staying there. The rooms are particularly nice and clean which is where your likely to spend the most time. The staff seemed exceptionally nice. One of our rooms was not listed for some reason yet the staff hooked us up and quickly made it right without any delay. The location is close to the highway and conveniently located near restaurants, gas, etc. 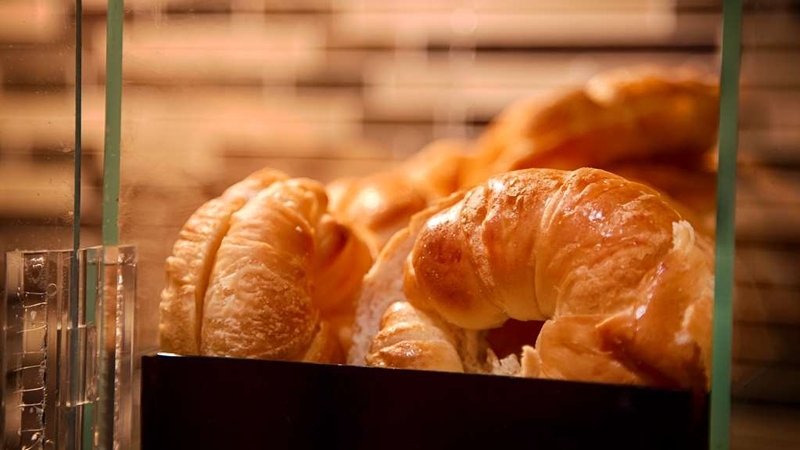 The hotel offers a basic breakfast with a few hot items to compliment the usual cold offerings. The WiFi worked great and the bathrooms were in great shape. Some rooms are smoking based on the odor in the halls, but our non smoking room was great. I highly recommend this hotel to price consciousness families, friends, and business travelers. Thank you. I am gald you enjoyed everything. Wonderful staff, helpful and friendly but the hotel is in desperate need of an overhaul. Carpets need replacing ( dirty and damaged ) walls needed paint. Nice breakfast and nice staff, also in a great location but I won't stay there again even though I'll be visiting Huntington WV a lot in the future I just can't get past the dirt and grime. I am very sorry for the problems you had during your stay. Thank you for your feedback and business. Would not recommend this hotel to anyone. We stayed here for proximity to soccer fields as our children were playing in a tournament. Front desk not professional or helpful at all. No elevator in hotel. Our room was filthy! Tons of Hair all over the bathroom floor & tub. Disgusting. Carpet barely vacuumed and layer of dust at the edges of carpet, against wall. Beds were old & saggy but at least had bed bug zippered covers on mattresses. Room needs a major reno! We grabbed a maid walking by and had her clean room again while we stood there. She apologized and said it was not her room and would let management know. We were only staying one night, so we dealt with it. But if I had known before hand, would have stayed at one of the other hotels that were 2 min away. I am very sorry for the poor condition of the room. That is not our normal standard. I understand how upsetting this would be. Again, I am very sorry. We had 3 rooms for the night. All nice rooms. Beds clean. Smelled fresh. Bathroom clean. Breakfast was good, nice variety offering. Easy access to interstate. Many restaurants & stores nearby. Good place to bring a family. This is a great Best Western with super friendly staff. Really love the outdoor pool as it's a great time of year to be outside. Comfy and down to earth decor with a really nice lobby. Rooms were very clean; I enjoyed the premium toiletries and comfortable beds. Super solid continental breakfast with all the favorites. This hotel is in a killer location with everything imaginable food and shopping wise in walking distance, also right off of the interstate. Plenty of parking for larger vehicles. Super quiet. We had a great experience and will definitely come back. Thank you for your business. I am glad you enjoyed everything. The 1st room had hairs all over the bed, the 2nd room the ac did not work and the 3rd room the ac leaked water all over the floor and had a bad smell in the room because of the water leaking on the floor. they was going to move me to a 4th room but we was tired of moving so we stayed in that room. after all of that trouble they did not offer us a discount. I am very sorry for the problems you had during your stay. I apologize that we were not able to get you a room to meet your needs. Poor counter service because he lied about not having a room. Only way we got a room was by calling Best Western International to reserve a room for the night. Room was clean, quiet and comfortable to stay in. I am very sorry for the confusion at check in. Thank you for your business. We had a enjoyable stay at The Best Western in Huntington! They accommodated our request to check out little later the next day because we were playing a show downtown that night. The hotel is very clean and spacious. I loved how big our room was and how comfy the beds were! It's also very easy to find the hotel right off of the highway. We would love to stay here again for the ease, comfort and friendliness we were provided! "Very ordinary would not stay again"
An unattractive bare appearance, small site no grassed area just parking all around the building. Very well received at reception. Very small public area. Rooms standard size, bed ok pillows small size filled, your head bounces off them. Many hotels now have the larger pillow with less filling very soft. Small outdoor pool just looks like an after thought. Breakfast one of the poorest I have had after travelling for 18 days. The plus point is there is a good restaurant next door! I am very sorry you did not enjoy your stay. Your feedback will help us to continue making improvments. "Don't leave anything in your room or it'll be taken even if you hadn't checked out yet"
I am very sorry this happened. Not all guest come to the front desk to check out. Therefore, housekeeping has to rely on if there are any personal belongings in the room to know if the guest it finished with the room. I understand this is not a perfect system and I apologize that they cleaned the room before you were finished with it. Could be cleaner. Room smelled of mold and dust. Room had dust around the edges and didn't feel clean and crisp. Staff were quiet but friendly. This location wasn't horrible just wasn't what we have come to expect as most Best Western hotels are cleaner and more crisp / refreshing. I am very sorry the room was not up to standardon cleaniness. I understand this can be upsetting. "Just passing through - asthmatics, read"
Pros: fast, easy check-in, the man was very nice. The bed is good. Pillows are floofy, and since apparently we aren't doing Spring this year, the heater is on and extremely efficient. Cons: The building is quite old, and nothing is ever going to get rid of the smell of cigarettes. The room does not smell of cigarettes initially, but I smell it now. Could be that the folks next door are smoking, though. There is no elevator, and the stairs didn't see the back side of the broom today. Decision: If you are just passing through and don't use an inhaler, it's adequate. If you do, this is not the place. Also, I picked couples because “passing through” isn't an option. Thank you for your business. I understand the concern of the smoke smell. I am very sorry. We do have one section of smoking rooms. "Two Night Stay a Pleasant One"
My husband and I are from Barboursville and live just a few miles from this Best Western Inn. We were having major plumbing issues at our home so needed to vacate it, for various reasons couldn't stay with family, so this seemed the best solution. We needed a pet-friendly place so this was our choice and once checked in discovered we weren't charged a fee for our dog! The room wasn't fancy but had all the usual amenities and was clean. The hotel provides a full, very nice, continental breakfast which we enjoyed both mornings. Because it is near the Mall there are many restaurants around with a few of those within walking distance. The price was reasonable, our stay pleasant and we would not hesitate to return. I am glad we could meet your needs during your house repairs. Thank you for staying with us. Didn't get there until 3am. Fairly quick check in. Breakfast was good.room was good. Everyone was very nice. Had my granddaughter with us and she made a little mess at breakfast. We told the employees and they were very nice and told us not to worry about it and cleaned it up. Made us feel welcome. Thank you for your business. I am glad you enjoyed your stay. "Overnight stay for a conference"
I chose this hotel because it was close to the interstate and to the location where the conference I was attending. As it was just myself, I wasn't looking for something overly expensive or showy. This hotel was pretty much all of that. The front staff were polite and quickly checked me in (I had preregistered so it was just a matter of verifying myself and providing a credit card in case). The room was fine for myself - two full-size beds, flat screen TV, refrigerator, microwave, desk for using with my laptop, Wi-Fi that came with the room, and bathroom. The bathroom was kind of small compared to other places I have stayed, but it would work for a single person visiting. Breakfast also came with the room price - kind of typical for what I have experienced under similar circumstances with other hotels that offer this amenity. It was a hot breakfast (fried eggs, though looked like they had been made in a mold, sausage, biscuits, gravy and other offerings). So, it served my purpose - a room for the night near to where I was actually going. Thank you for your feedback. I am glad we were able to provide the lodging you were looking for. We would love to have you stay again. 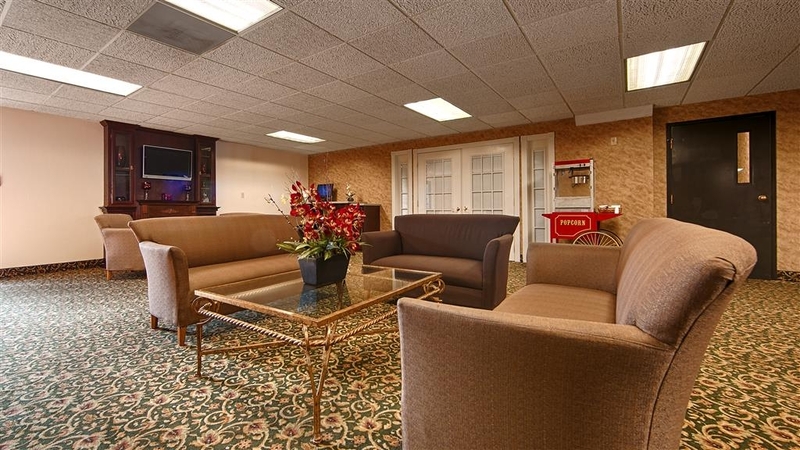 The hotel is convenient to the freeway, and we found ample parking. The staff was very friendly and helpful with advice when we discovered that there was a surprise significant snowfall overnight, and continuing in the morning. We slept great, and would return if in the area. Thank you for your business and feedback. We are happy everything was accommodating during your stay. We had an excellent stay at Best Western Huntington Mall Inn - conveniently located right across the street from the Cracker Barrel. My favorite part about this place was their spacious and well-stocked gym, only two doors down from our room! 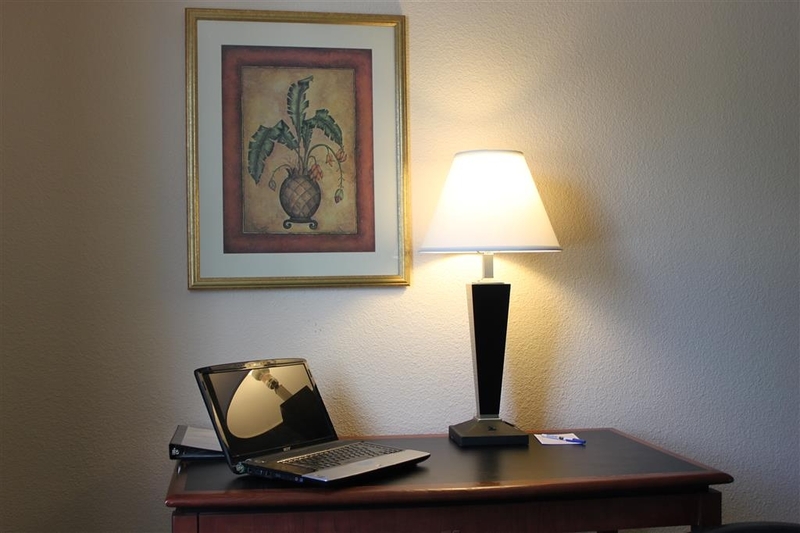 The staff was friendly and helpful, the room was clean, comfortable, and quiet. I loved the carpet in the hallway! Breakfast was delicious. We'll definitely be back! Thank you so much for your business and feedback. We look forward to having you stay again soon. "Cozy, Comfortable, Convenient & Cordial"
Conveniently located right off of Highway 64 in gorgeous Barboursville, WV, with a fine selection of eateries (Outback Steakhouse, Sonic), gas stations, and nightlife hotspots (Uncle Bill's Pub & Grill) ALL within walking distance, the Best Western Huntington Mall provided not only a comfortable and cozy place to sleep, their staff was so friendly and helpful to all of our needs. On top of that, I cannot say enough times how incredible the water pressure was in their shower. Very invigorating. For those looking to get a nice workout, please visit their wonderful fitness center. The continental breakfast had some much to offer, a delicious and extensive spread of food and gourmet coffee. Upon checkout, we hit the road feeling incredibly well rested, energized and grateful. 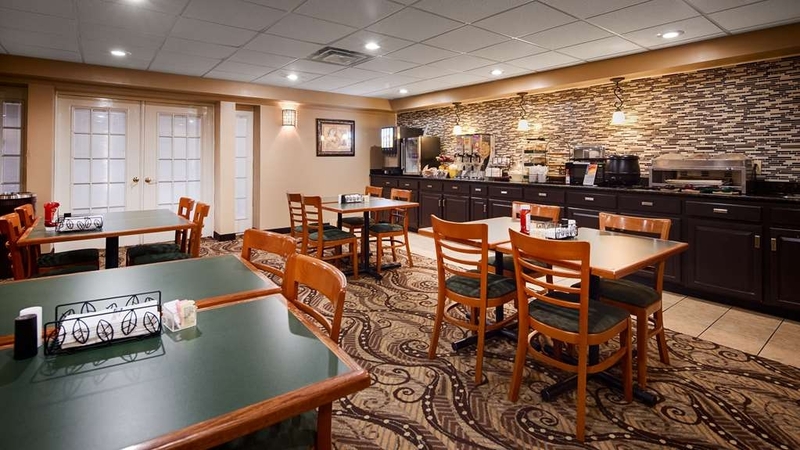 If you're ever in the Barboursville, WV area and are in need of a cozy safe haven for the evening, the Best Western Huntington Mall delivers. Wins all across the board. Thank you so much. I am happy you enjoyed your stay and everyone was helpful and friendly. We hope to have you stay again. "After booking hotel my room wasn't available"
I'm a Best Western diamond member and booked a king room on the 1st floor because there is no elevator and at 70 years old my knees won't do stairs with all the luggage and equipment for work. I worked until 8:00PM so when I arrived at the hotel there were no king rooms available on the 1st floor which I booked through the Best Western web site. They tried to give me two dbl. beds on the 1st floor for the same price as the king room. So I cancelled my reservation and stayed at a luxurious room at the Holiday Inn up the street. I have stayed at the Best Western at least 5 times previous but will never stay there again. I am very sorry we could not accommodate you. I understand that this is upsetting after a long day and travel. I hope you will consider us for your next stay in the area. All around great experience at this hotel! The rooms and bathrooms were very clean, and fully equipped with all the necessary sundries. The beds were extra comfortable, and had fresh sheets and pillows. Everyone at the front desk was very helpful. 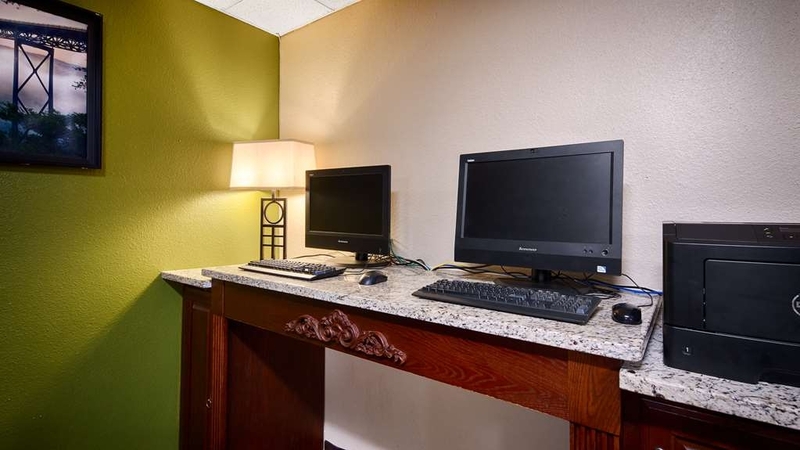 This Best Western is also conveniently located across the street from a number of good restaurants, within walking distance. Five stars all around! Thank you for your feedback. I am glad to hear you enjoyed your stay and found everything accommodating. Thank you for your business. I am very sorry to hear about your stay. Unfortunately, when groups of kids stay the noise level can be higher than normal. I am very sorry we were not able to move you rooms to make you and your mother comfortable. Again, I apologize for the problems during your stay. This motel was close to the highway, with major restaurants within walking distance. The hotel staff was very helpful, gave us a menu for one of the restaurants we inquired about. Across the motel parking lot we could walk to Outback, Steak and Shake and Fat Pat's, across the road was a Sonic Drive In and Cracker Barrel. The beds were very comfortable, and the towels appeared to be new. My only complaint would be that the plumbing was fairly loud, our's and our next door neighbor's. We knew when they were using the water. I understand the noise of the water can be distributive and I apologize. I am glad you enjoyed the rest of your stay. Thank you for your business. Thank you so much for your feedback. I am glad you enjoyed everything. We would love to have you stay again. Very nice place to stay quick service at check-in nice rooms very clean beds are very comfortable nice pillows internet works well very close to shops an places to eat easy access back on to the intersate and the manager is very nice thanks for all your help. Thank you so much. I am glad we were able to help you. Thank you for your business. Excelllent stop over. Hotel was Clean, Comfortable and well located. Staff went out of their way to return and forgotten item after my departure. This is my 3rd satay at this facility and it definitely will not be my last. Thank you very much. I am glad we were able to get your items back to you. We look forward to having you stay again. "I love this hotel! and highly recommend it!!!" Thank you so much. I am glad you enjoyed everything. We would love to have you stay again. "very hard bed and very nosy heater and thin walls"
If you are looking for a comfortable bed then this place is not for you. The bed was extremely hard and the heater made a horrible noise when it kicked on we eventually turned it off so we could get to sleep . The walls are very thin heard the guy next door yawn and could hear them talking very plainly. The rooms were very clean and decorated very nicely. Had to rate this poor because of the bed.that comes behind cleanliness to me. I am very sorry that you were not able to rest well during your stay. I understand that this can make a trip hard. I also want to apologize for the other problem you had during your stay. Awesome hotel! Definitely coming back again! We were welcomed by a highly professional staff and Id like to give special mention to Mark who really went above and beyond as an employee! The hotel was gorgeous. A beautiful entry way decorated for the holiday season and hot chocolate and coffee offered upon arrival. Yum! Once in the crisp and clean rooms we were instantly impressed. Gorgeous art work, refrigerator, microwave, hair dryer, ironing board, tv, a desk, plenty of storage space and mirrors. The bathroom came with all we needed and the water pressure was WOW! Nearby we enjoyed the Karaoke Bar, the laser tag, and our favorite... Cracker Barrel! Absolutely loved this hotel and will be back whenever we are able in the future!! Thank you Best Western! Thank you so much for your wonderful feedback. I am so happy you enjoyed your stay. We would love to have you stay again. I will be sure to let Marc know about your stay. I was staying at this Best Western in order to have a Holiday Celebration with my wife's family. The hotel room was very comfortable and clean -- and had a nicely comfortable bed. 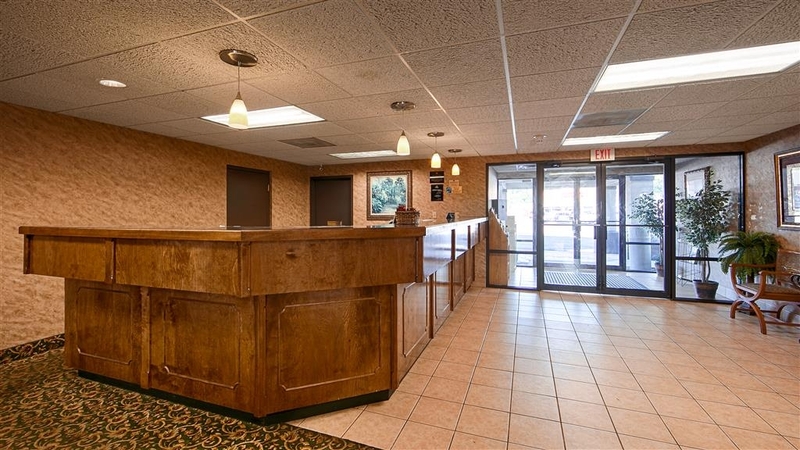 Also - the Hotel is at a really convenient location off the Highway (I-64) and is close to the Huntington Mall and numerous restaurants. The only thing I found to be lacking was that this Hotel needs an Elevator for people with disabilities -- it only has stairs currently. Also - the Hallways had a strange smell to them -- sort of "musty" -- like old paint / or carpeting, although the room itself smelled fine. I would indeed stay at this location again, a good price and comfortable! Thank you for your business. I hope you and your family had a great Christmas together. I understand your concern about not having an elevator, but we do have handicap rooms on the first floor. Thank you, again. We would love to have you stay again. This location is seriously in the heart of everything... shopping, dining, etc. The hotel is clean and staffs were friendly. The rooms could use some updates, i.e., a bit bigger bathroom and handle bar in the shower/tub. Overall stay was great. Slow time of year. but still excellent service including breakfast. Evidently recently remodeled as very clean. Very good stay. I have stayed here many times years ago and everything has defiantly improved . Thank you. I am glad you liked the updates. Thank you for your business. We would love to have you stay again. I stayed here quite a few times and one time I found a couple roaches in my room.. apparently they thought I was lying and sent someone to check and came back and said they found nothing ,even though I caught one of them in a cup... the next time was the same except it was bed bugs... gave them the cup with the live bed bug in it and I was pretty much called a liar and was put on a “do not rent room” list for complaining about the bugs. Worst hotel I've ever been to... I definitely will not go back to that poorly run place again. Read the reviews.. it's all saying sorry we will improve.. check the dates also.. how long does it take to get it together?? I am very sorry for the issues you have had during your stays. I understand your frustrations. As far as improvements, we are always looking for ways to improve and better the staff and hotel. "Conveient location and great price"
Myself, my sisters and friends always stay at this hotel for our 3 day Black Friday shopping trip, have never had any issues or problems. Friendly staff, plenty of choices for food and shopping. We will continue to stay here. I am very glad you enjoyed your stay. I hope your black Friday shopping was fun. We hope to see you next year. Thank you for your business. I am glad you enjoyed everything. I hope you stay again with us. 2nd time in a week at best western; the other in Kentucky. Both hotels tv cable was CHEAP and inadequate. No online TV guide. Had to scroll up and down remote constantly. Channels mostly old shows, news channels, sports, home shopping, hgtv etc. will NEVER stay at BW again. After a long day, we want to relax and watch some decent tv. If owner that CHEAP, we won't spend our money there either. Would rate no stars if possible. I am very sorry for the inconvenient of the TV. I understand how upsetting this can be after a long day. I am very sorry we were not able to accommodate you. "Advoide this hotel - unless changes are made"
The front desk staff Stephanie was very good but it went down from there. The room smelled like many dog had been living it for many day with out cleaning. Yes, I had a dog with me as I travel with him all the time and this was the only room where he did not stop smelling the carpet. The refrigerator was open not working and had towels hanging out of it. When the bathroom fan was turned on it made a terrible loud noise! Tried to go out of the exterior door and they were so many smoker standing right there. I travel a lot on this route and I'm loyal to Best Western as they do take dogs but I will be looking for an alternative hotel to stay at in my future trips as I was very dissatisfied with your hotel. I am very sorry for the problems you had during your stay. I understand how upsetting this is. I wish we would have been able to get you to a different room. I am glad to hear the front desk was able to assist you. Again, I am very sorry this is not our normal standard. I hope you will give Best Western another chance in the future. If the coffee and breakfast food were better I would've given it five stars. There was a diaper under the skirt of the bed when we got there. Always makes you wonder what else they didn't bother to clean if they can't clean the floor. The staff is nice. Professional. I think the location is great. It's next to food, games, and the mall. And major highways. I really need better coffee and eggs. And stock up on sugar. They ran out the morning I was hitting the road. Ugh. I am very sorry for the issues you had during your stay. I understand your concern about the room. I apologize for the lack of sugar during breakfast. Thank you for your feedback. Excellent location, plenty of parking. No highway noise.Room was clean, bed was comfortable with good pillows. Room was warm all night with heater that did not wake you when it started. Will stay at this Best Western again next trip. Thank you so much. I am glad you enjoyed everything. We look forward to having you stay again. Very good check in staff. Breakfast was very good and well maintained. Room was large and fairly clean. Some parts of the hotel were not overly clean. Nice location just a few minutes from Huntington. Probably would stay here again. Thank you for your review and for staying with us. I am very sorry not all areas were clean. I have stayed at your hotel twice now. Both times I've arrived late into the night and greeted by staff that are always bright and cheerful. Thank you for remembering what customer service is and making me stays comfortable. Thank you for your business and being a return customer. I am glad your stay was enjoyable. We look forward to having you stay again. "Dirty dirty dirty. Poor overworked girl here last night had no one to help." We were going to stay at Holiday Inn but this was cheaper and seemed to have good ratings. On arrival we were shocked at the dirty lobby carpet, stained lobby couches and our rooms floor was not clean. Bodily fluid stains on box springs cover. We stayed only because we had to with 24 hour cancellation we would have lost our $; live and learn. I am very sorry the hotel did not meet your standards. The staff wants everyone's stay to be welcoming and meet their standards. Thank you for your feedback it helps us improve. Room was neat, clean and comfy. Hotel staff were friendly and helpful. A very nice stay overall. Just needed a place to stay overnight as I was going back to the area for a retirement party. I'll stay here again next trip. Thank you very much for your business and feedback. We look forward to having you stay again. Clean rooms, nice staff, delicious breakfast; what more could you want? Also very convenient placement for local shops and restaurants. Price was very affordable and considering all the complimentary things and useful services is worth the price. Would definitely stay again! Thank you very much. I am glad you enjoyed your stay. We would love to have you stay again. Motel was convenient to I-64, Clean room, friendly staff and nice breakfast. We didn't really need a handicapped access room though! Only downer was the staff arguing about a co-worker loud enough for everyone in the lobby to overhear...really? I am very sorry that the staff disturbed you during your stay. This will be addressed. Thank you for letting me know. Again, I am very sorry. "Nice Place Outside of Huntington"
This hotel is next to a mall in Barboursville, WV. It's about a 10 mile drive to downtown Huntington, so a great option if you're looking to save a few bucks from the big downtown hotels. The front desk staff as very friendly and got us checked in quickly. The beds were comfortable, the wifi worked well and there a ton of great channels on the TV. The room was clean and spacious. Our van was safe in the lot too - a BIG plus! Near the hotel is a Sheetz, which does made to order fast food in a convenience store setting - a surprisingly good place!!!! Thank you for your feedback. I am glad you enjoyed your stay. I hope to have you stay again. "Affordable hotel with all the essentials"
This was a large hotel conveniently located right off the highway. There are several restaurants nearby and they have free breakfast. The rooms were clean and the beds comfortable. This place even had chicken patties for breakfast, never saw that before. They also had other items for breakfast, a pretty good selection. The place was large and seemed full the night we were there. Clearly a popular location. 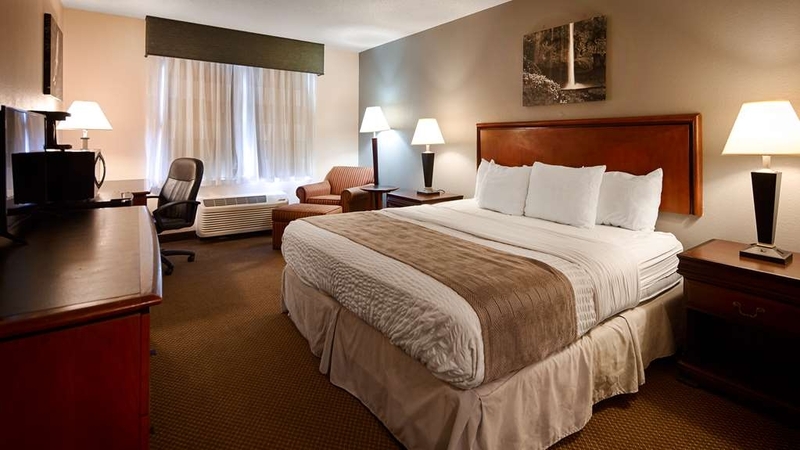 Perfect for the one night stay on the way to the New River Gorge Bridge area. Easy to find, right off the interstate, with many choices for dinner within walking distance, but we ordered in. We had reservations for a room on the first floor as there are no elevators and we were accommodated nicely. Beds and pillows felt extra comfy. Breakfast was adequate and hit the spot before getting back on the road. We stayed here as we were passing through. Quite and comfortable for a good nights rest. A bit outdated but clean. Breaskast was good to get you on the road. The curtain would not block all the light coming in the window. If you don't stay here you have missed a great place to not only stay but all eatery are in walking distance and you have a lot to choose from. We have stayed at the Hampton Inn across the street, very nice, can be pricey but Best Western offers a great rate for Government, Senior and almost any reward card you have. Nice hotel, clean rooms and friendly staff. We have stayed at this hotel several times and have decided it will be were we stay when we are in the area. It is close to shopi ping, restaurants and area attractions. A good place to stay if you are in town for a game, Go Herd!! Thank you. We look forward to having you again. We found this hotel very clean and very comfortable. My sister and I were visiting family as we do at least once a year. We would certainly stay at this hotel again. The young lady who prepared the breakfast was very helpful and she did an excellent job. Thank you so much. We are looking forward to having you again. I am very sorry you were unhappy with your stay. We try our best to get people in the room type they prefer if it is available. Thank you for letting me know and for your feedback. Great check in and check out experience. The staff was helpful with our schedules. Appreciated the carts for luggage and the access to the room. They were accommodating for our special needs. thank you! I appreciated the location and the room was very comfortable. The beds were comfortable which I am sensitive to due to health issues. Everyone was friendly. Made our stay very good. I would recommend this as a great place to stay if traveling through or there for a business visit. Thank you. I am very happy you enjoyed everything. The Best Western Huntington Mall Inn hotel was clean, comfortable, and spacious. It also had the longest hallway we have ever seen - truly a sight to behold. The beds were comfy, the towels fluffy, the shower well-pressured and hot. Thank you, Best Western. This hotel is convenient to everything we needed for our stay, however, the room had an odor of previous guest who smoked. Even though the hotel had no smoking signs displayed on the doors, it was very strong in our room and even had ash trays in the room. First off, I want to say for the age of the hotel, I felt it was very clean. However, you could still smell smoke in the room from years ago when smoking was still common indoors. We were traveling and the next night when I put my pajamas on, they smelled like smoke from the night before. The decor was dated and it's probably due for a huge renovation in the near future. However, that being said, it was clean and the staff was friendly and helpful. The breakfast was the standard hotel fare of hot and cold breakfast items but again, the breakfast area was clean and well stocked. Overall for the price, it was a bargain. Thank you for your feedback. I apologize for the smoke smell, but we do still offer a smoking section in the hotel. 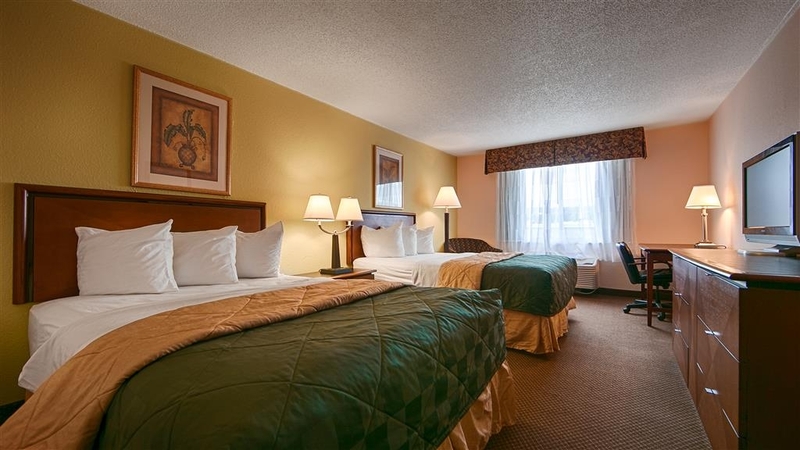 "Good value, clean, comfortable rooms and bed"
Very good hotel in Huntington WV. Older hotel, but well maintained, clean, comfortable bed. Happy to learn Best Western had Smoking Rooms available, as I am a smoker. Hotel also allowed pets, which caused no other guests any problems. Will stay here again!!! The you. We hope to have you stay again. Our trip to see the eclipse was long and we looked for a convenient overnight stay. this hotel fit the bill. Set in a mall with plenty of restaurants around. It was easy to find off the interstate with restaurants literally a short walk across the parking lot. Bed was comfy, breakfast was fine. Drawbacks: no elevator. We got a room on the 2nd floor and would have had to haul a weeks worth of luggage upstairs. Further, the first room we got had the ice machine just outside the wall. We heard water rushing so you may want to be aware of that. I think it was room 218. We asked for a new room and we were cheerfully accommodated. Kudos. FYI it is also pet-friendly. "No Frills but clean and comfortable"
My overall impression of the hotel and our room was that it was clean and comfortable. For one night it was exactly what we needed. This hotel does not have an elevator but was able to put us on the first floor when we requested a first floor room upon check in. The Mexican restaurant across the parking lot was a good choice for dinner, but I'd suggest skipping the gift shop on your way out. No elevator, at least we were not told of one, had to use the stairs. With a lot of luggage and bad knees that is rough. The building is old but over all our stay was not bad. Staff were very nice, even though they seem to be having a busy night with last minute check ins. I am very sorry, but unfortunately we do not have an elevator. Thank you for your feedback. I am very sorry the room was not as clean as it should have been. Thank you for letting me know. Front desk fast, efficient and friendly. Room average clean, mattress was a little soft thin blanket and towels. Tiny little bars of soap for hands and bath. Free breakfast standard buffet items. The only downside was pool area was dirty - popped balloons and cigarette butts. Excellent customer service and breakfast. Hotel is conveniently located close to the mall and there are two outstanding restaurants across the parking lot...Outback and The Tortilla Factory. East access to I-64 East and West. Thank you and I am glad you enjoyed your stay. We have a 700 mile drive from St Louis to Roanoke. If we dont feel like driving thru, we stop before getting to the WV turnpike at Barboursville at the BW. Good beds and a friendly welcome. They have updated the rooms and there are good dining choices nearby. Breakfast is included, and they are pet friendly. Our favorite nearby attraction is the Blenco Glass Factory--observation deck and factory outlet. The staff was friendly and efficient, the rooms were clean, the beds comfortable, the ac worked well and the hot breakfast was great. The only drawback is the lack of an elevator for the upstairs rooms, so reserve the ground floor if you don't want to carry bags up the stairs. room keys had to be reprogramed every time we left and came back. the television was programmed so the volume will not go above 35 setting. refrigerator did not work and none of this got fixed until the last full day were staying there. I am very sorry for the inconveniences you had during your stay. Thank you for letting me know and for your business. The Title of this hotel implies that it's in the Huntington Mall from what I saw it was not, the mall was about a 1-2 miles away from the hotel. Admittedly the mall catered for all a travelers needs but transport is needed to get there. The hotel itself is quite good with comfortable beds be it a little noisy from other residents. They had no elevator, or provided any breakfast that I recall but the did have a coin operated laundry. The hotel is near to through traffic highway and easy to access. Check in was a little confusing as there were a few at the front desk conversing with each other but we got our room. Not sure if there was an elevator - just told to take the stairs to our room. Room was clean and beds comfortable. It is not near or next to a mall. The pool was nice but you have to ask for towels at the front desk - there is no signs on where to get towel and there is no place to turn them in except drop them off at front desk. Pool water was cold. You can hear people and dogs barking in adjoining rooms. Breakfast was okay. Walk across the parking lot for an excellent dinner. I'm very sorry, but unfortunately we do not have an elevator. I am sorry this was not explained at check in. Thank you for your feedback and business. This is a very clean and comfortable motel. We were impressed with our room and also the great breakfast. Great location close to restaurants and the mall. We really enjoyed our stay here and will stay here again when passing this way. We had stayed at this Motel before and therefore we knew about where we were. Greatly enjoyed being here again. Our room was great for us. HANDY-CAPABLE! Roll-in shower as I cannot get into a tub. What a blessing and so many people willing to help was incredible. The bed and bedding was clean and soft. Bathroom linens were too. The breakfast room was clean and the personnel here were very helpful too. They have a good variety of breakfast foods. Seven days I had nothing to do but enjoy being alive in Huntington, WVA. As we were leaving they gave us a "to-go-bag". Contained granola bars, Apples, Bananas, Oranges and Water. Sure came in handy at the Airport. Many thanks to all who made our stay in Huntington, WVA. memorable. Will try to stay here on our next trip to W.VA. . Thank you to all who made our stay here memorable. Thank you so much. I am glad you enjoyed your stay. Hope to see you again soon. "A very nice stay at a great price"
I recently spent 5 nights. The bed and bedding were awesome. The room was incredibly clean as was the hallway. Many restaurant choices nearby. Friendly and professional staff. I only ate breakfast once there but the offerings were really good! Thank you very much. I am glad you enjoyed your stay. First: hotel has no elevator. Second: will not rent rooms to the LOCALS. Third: after being on the road since 4am it would have been nice to be greeted with a smile. Instead, I got no eye contact, since she was just staring at the computer screen and a abrupt "name please, driver's license and credit card" as I was telling her she reminded me of my sister in law and just being polite. Just abrupt and hurry up you are bothering me attitude. Forth: hotel is clean. I am very sorry you were not properly welcomed at check in. Thank you for your business and feedback. The feedback will help us improve for the future. "A nice hotel for a one night stay." The Best Western Huntington Mall Inn, Barboursville, WV is a nice enough hotel, however, the lack of an elevator makes it somewhat difficult if one travels with heavy luggage. The stairs were steep. The room was fairly nice, but noisy at night. "Fine stay for travelers driving through "
We needed a place to stay as we were traveling from PA to KY and wanted to stay outside Charleston. There are many options, but this one was rated well and inexpensive, a good option for a short stay. Our room was on the second floor (no elevator, so they made sure we were ok with taking stairs.) The room is updated well enough. It was clean and the AC worked fine. My only complaint was that it was musty, as other reviews stated. Our room didn't feel like it was smoked in recently, but at some point. Breakfast was good (and included.) coffee was good, biscuit and sausage sandwiches were provided, as well as a waffle station. They had a few cereal options and oatmeal. Not many gluten free options, but fruit and yogurt was provided. A fine place to stay if you need close to the highway, free breakfast, a warm bed and inexpensive. "A good stopping off point"
The BW facility was in a convenient location, with restaurants and shopping close by. The hotel is an older garden style facility and shows its years but is still adequate. The satellite tv service was mediocre. Thank you for your feedback and for staying with us. "Comfortable overnight stay with my 3 boys"
Rooms and lobby were great, did not smell any smoke like some reviews had mentioned. Breakfast was usual, a bit dull in comparison to the breakfast at BW Winchester, KY where I had stayed a week earlier. No complains on the room and beds and cleanliness. I would stay here again. The room and bathroom were very clean. The staff were very friendly and helpful. Several good Restaurants are just next door within walking distance. Hot breakfast is ample with several good choices. Easy access off and on to highway 64. "Ok place of you like cigarettes." I just believe every hotel in America should forbid smoking of any kind in the rooms. My daughter had a soccer event in town and the last thing we needed was to weeze do to the aroma of cigarettes. We went and bought air fresheners and ran the air. It still smelled terrible so we kept are luggage packed. I am very sorry for the smoke smell. We do our best to contain the smell to the smoking section. Thank you for your feedback. Horrible experience with in being put in a smoking room with a child who has severe allergies. All of our clothes, luggage, soccer equipment, etc. reeked of cigarette smoke. The toilet had mold/mildew rings and the shower had holes from missing grab bars. The only positive thing that I can mention is that Amanda and Chris at the front desk were excellent and tried to assist in any way possible. I am very sorry about the problems you had during your stay. I am happy to hear the front desk staff was helpful. Thank you for your feedback. "NO ELEVATOR, hotel great otherwise"
No elevator, so we had to haul our suitcases up a long flight of stairs. If I had known at check in, I would have requested ground floor. Otherwise hotel was nice. Pet friendly and the Mexican restaurant across the parking lot is really good. Thank you for your feedback. I understand the inconvenience of not having an elevator and I apologize for it. "Best choice for the price"
My husband and I spent the night as we were passing through and stayed again on our way home. Great service, great breakfast, and very comfortable beds. The hallway smelled of smoke on one of our nights, but it did not affect the room at all. Would definitely stay here again. I am very sorry about the problems you have. Thank you for your feedback and for letting me know. "ADA review: Not bad for a night"
This has a number of advantages--it is an easy off, easy on from interstate and you can walk across the parking lot to a couple of decent restaurants which is nice after a day of driving. We stayed here on our way to Washington, DC. Got late afternoon, early evening. TV was ok, room seemed clean and bed was comfortable. Breakfast did not seem particularly great, but was ok. Coffee was ok, but needed to have half & half available. Parking lot was rather rough for my mobility scooter. The accessible shower was good! We did have our sleep disturbed by a group of motorcyclists who roared in parking right outside our window, but not much the hotel can do about that. Thank you so much for your feedback and business. Thank you for your business. We hope to have you stay again. Thank you so much for your business and feedback. "Lots of choices in this area...."
I found this to be a clean, neat and well lit property. I was impressed by the amount of doors to access different parts of the property with plenty of parking. You didn't have to walk far no matter where your room was located. My room was spacious and clean. I had all the amenities I'm use to having at a BW. Breakfast had a good variety and well taken care of. You could walk to a bar/grill for dinner if you didn't feel like driving. Shopping close by, too. Quiet stay. I stayed at this hotel twice within 10 days. The manager is kind, helpful & very knowledgeable. Without a reservation I got the room I wanted each time. I slept well, love the security & breakfast was great! This hotel is clean and in good repair. The staff seemed to be friendly and helpful. I had no issues during my stay. I would recommend this property for a short stay because of the exceptional value of the quality vs. price. "Nice room - great breakfast"
The bed was very comfortable. There were many choices for breakfast both hot and cold. The staff was accommodating and helpful when we needed to change our plans. 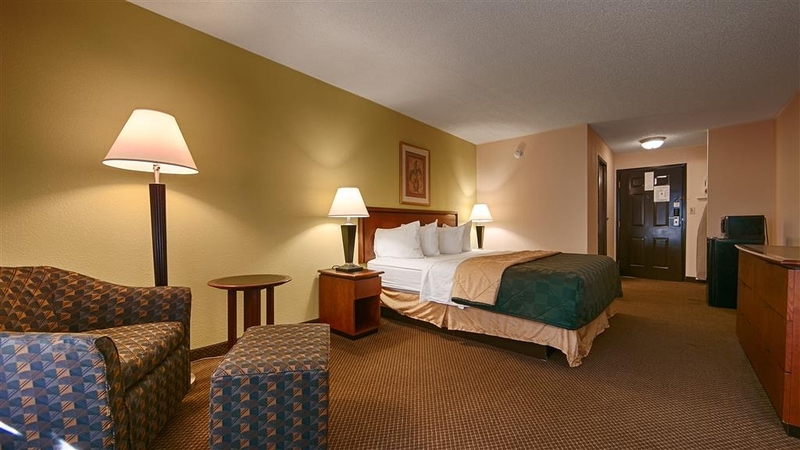 The hotel is located near stores and restaurants with easy access to the interstate. Thank you. I am glad the staff was able to accommodate you. I am very sorry about the issues you had during your stay. Thank you for letting me know. Booked this place on the go based on reviews while driving back from OBX, felt like we stayed at the wrong place. Arrived late, problems with reservations though could've been AAA fault. Initially was given keys to room that was already occupied. and had to go back to front desk. Room had some improvements however was seedy. Bed wasn't comfortable, lots of noise. Met the need for sleep, however for the price expected a lot more. I am very sorry to hear about your experience. I understand how upsetting this is. I would like to apologize on behalf of the staff. Thank you for your business and feedback. My wife and I stopped here for one night on our way to KY. We are Diamond Members and used points. I had reached out before to request quieter room. Anna the GM responded personally. We arrived later. Check in was easy, efficient. Room was in pretty quiet wing (on edge by main highway but didn't really hear traffic). Plentiful parking etc. Room was clean, great AC, nice fridge/micro. LOVED the shower. Pretty good breakfast for quick hit before moving on. Good coffee. Everyone I encountered was helpful, pleasant etc. Overall would definitely recommend and no question stay here again!!! Thanks for a super night's sleep. I am very happy you enjoyed your stay. I am so happy I could with your reservation. I was really impressed by the cleanliness of the room, even up against the corners where the carpet meets the walls. Everything was tidy and neat when we arrived. Bed was very comfortable. Breakfast was good. I stay in hotels every week due to my job. So I spend a lot of time in and out of hotels. My stays at best western has been better then most of the other hotels I've stayed at in the past few weeks. Management and staff are friendly and helpful. Well it was not heaven but certainly not hell. A good value for a short stay. Nice staff and a dated but clean property. Food is passable for holdover until lunch time. We have stayed here several times. It is half the cost of most places in the area and certainly that makes it a good buy for those not looking for luxury. We are very pleased with this hotel, bed was great, pillows, very nice, clean room, had microwave, small refrigerator, a big plus there, nice big tub, shower pressure was great, i will stay here again. Breakfast was normal, like other places, but it was good. Had no hot chocolate though. hall way at night was some noisy because of some children running up and down, did not say anything too management , but parents need to be more respectful. I understand how upsetting the noise can be. I am very sorry. Thank you for your business and feedback. Front desk staff does a wonderful job. The morning clerks were just super nice, pleasant and helpful. 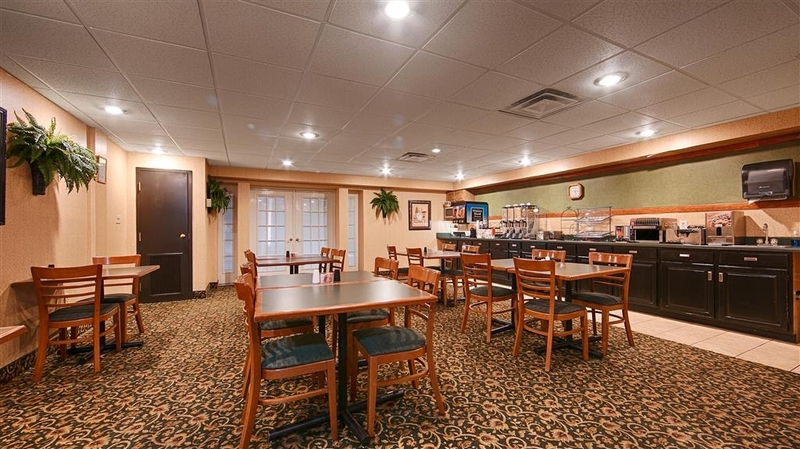 good breakfast, room was clean, good location, close to interstate and mall. would appreciate the decent rate. Overall a pleasant stay. Mostly Acceptably clean(some dust and cobwebs under bed and in corners). Limited tv choices and marginal tv quality. Bed clean and comfortable, good water pressure. Some noisy upstairs guests for awhile and an alarm went off in evening; quickly silenced. Would stay again. I am glad you enjoyed your stay. Thank you for your feedback. Usually stay at another chain but they were all sold out. Took a chance based on a The area and existing reviews. My company has a $150. Per night limit and this property was a good deal at just about 1/2 of that. 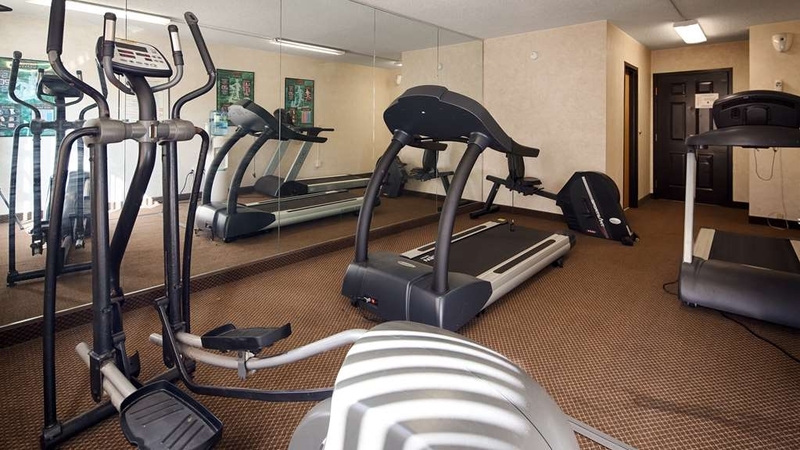 Good location, clean facility and appears well maintained. In room coffee, fridge and microwave. I'm pleased. Thank you very much. We hope to have you again. "Not really Best Western standard"
Having booked lots of times at Best Western hotels we expected more than we got. The hotel is dated in dark browns, no elevator, old stairs and worn carpets. We had to change rooms as the one we were in had leakage from the ceiling when it started to rain. Location close to the mall is a plus. Breakfast was good. I am very sorry to hear about the issues you had during your stay. Thank you for your feedback. 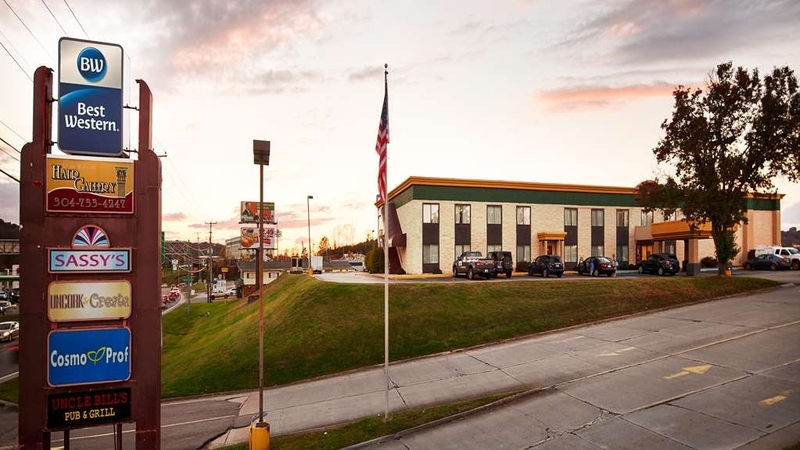 Good location right off the highway, near several restaurants (Outback is right across the parking lot, Cracker Barrel across the busy thoroughfare). Service is very pleasant and helpful. Beds were very comfortable. Breakfast was good. However, the toilet seat was scarred and should have been changed a long time ago, and the wifi was very difficult to get working. The tv remote didn't work. Small things but indicate maintenance needs work. I am very sorry. I understand how the little things can be upsetting. Thank you for your feedback. 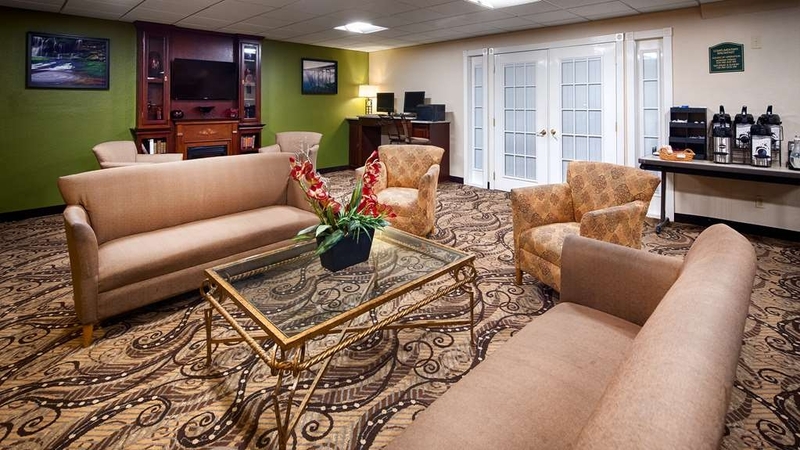 "A Five star rating from our family to Best Western"
From the moment you make the call or walk into the lobby of Best Western you are greeted with professional, courteous staff that treat you like family. The check in is smooth, the stay is comfortable, the staff puts your every need in first place. I recommend Best Western to anyway in this area. The staff respects each person as an individual and not just another customer. Thank you so much. I am glad you enjoyed your stay. Thank you for your feedback. This Best Western is badly in need of updating. Hallways were dirty and carpet was raggedy. Our room was OK but was awaken at 5:30 a.m. by the loud sound of running water as someone was showering in the next room. Breakfast was awful, the waffles had a very sour taste, pancakes were cold and leathery, muffin wasn't any better. Tables in breakfast room needed cleaning. I am sorry we didn't meet the breakfast standard. Thank you for your feedback; it helps us improve in the future. Booked room through Priceline "express deal" and we were given a smoking room when we checked in. Tried to get moved to non-smoking and told they had none so we were stuck with a very stinky room. The bathroom light didn't work. Breakfast was provided, but all of the "hot" food was cold. The staff were all nice, it was quiet & it was a good location but I would choose another hotel for the next stay. Very disappointed for the price I paid. I am very sorry. 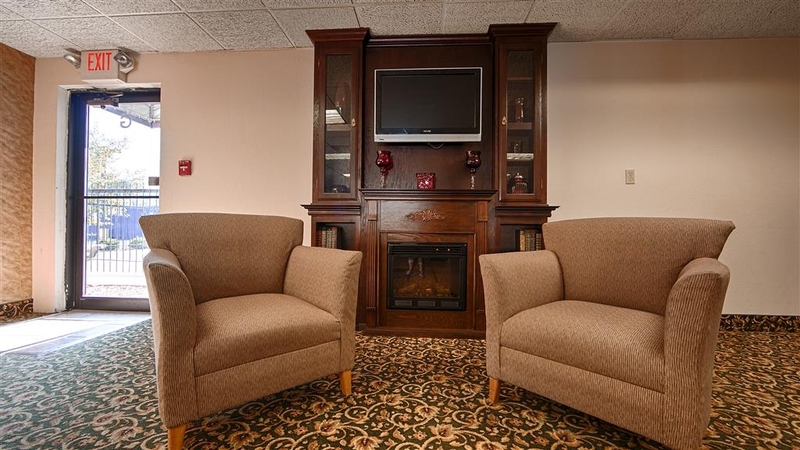 We try to move people to non smoking room if we have them available to meet our guest needs. Thank you for your feedback, so we can improve in the future. First stay at a Best Western and it met my expectations. Staff at check-in was not friendly but rest of the staff we encountered during our stay were good. Room was clean and comfortable, breakfast was better than most. Fire alarm went off at 6:30 a.m. Sunday morning and it took awhile for that to get taken care of but was able to go back to sleep eventually. All in all was a good stay and I would stay here again. I am very sorry we had problems with he alarm during your stay. Thank you for your feedback. My husband and I stayed here for 1 night for a concert in Charleston (we decided to save some money and hit up the mall the next day). Breakfast was delicious. Staff was very nice. Everything seemed pretty clean. Bed was comfy. The only problem I had was VERY thin walls. We could hear the lady in the room next to us cough all night long. Besides that my stay was nice. Thank you for staying with us and for your feedback. 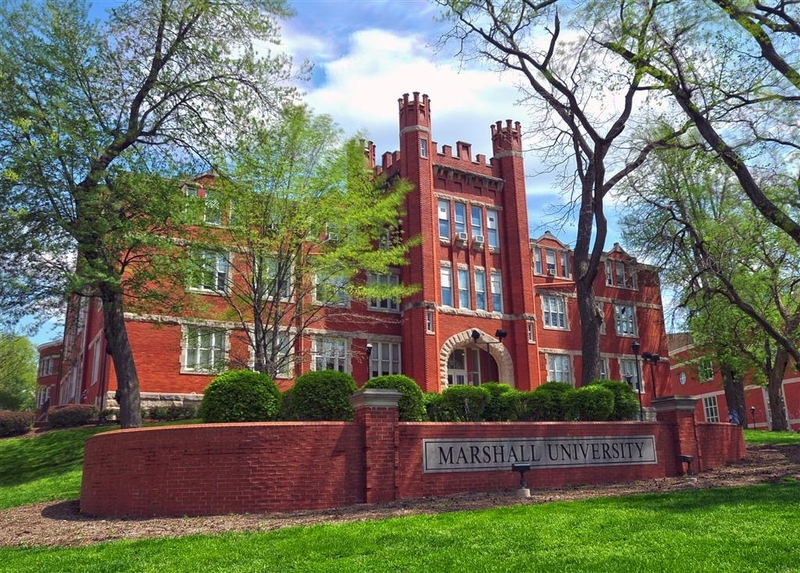 "Good Place to Stay for Marshall Homeocoming"
The hotel is a 15-minute drive to downtown Huntington, but is located right by the Huntington Mall and many other shops and restaurants. We found it to be a good spot to stay for Marshall Homecoming festivities. We had an overall good stay, but the fire alarm malfunctioned and went off repeatedly between 6 and 7 am on a Sunday. However, the hotel staff apologized for the inconvenience at check out and discounted our bill for our trouble. Very responsive! I am glad we were able to help for the inconvenience of the alarm. Thank you for your business. Ecxellent service, clean nice rooms, great bed. Great Breakfast They have a great staff, they were so polite,they answered all my questions and they even opened doors for me when I had my arms full. I would recommend this location to anyone. Wonderful! Thank you so much for your business. Excellent location on I-64 for proximity of Huntington at the Huntington Mall. We literally walked from the hotel across the parking lot to restaurants and shopping. Friendly staff, comfortable bed with plenty of pillows. Great water pressure in the shower and the sink. Room has been updated with flat screen TV, bathroom granite countertop, and nice bedding. Still dated carpeting but room was freshly painted and well maintained. Complimentary breakfast consisted of scrambled eggs, boiled eggs, bacon, fried potatoes, sausage gravy, biscuits, bread, bagels, danishes, muffins, cereals, yogurt, juices, coffees. The dining area was of good size and easy to configure tables and chairs for 2 people or families. Staff was constantly refilling items so rarely out of anything. Outdoor pool, but not open now (October) Would definitely stay here again next time we're in the area. Our stay at the BW in Barboursville, WV was a very positive experience. We were greeted by a sweet young lady who made us feel welcome. We had a positive experience at this hotel. My only concern was one of the side doors was broken in that one could open it without a key card. When I brought this to the attention of the desk clerk she said they already had a work order in. On Monday when we left it still was not fixed but they were working on it. So I would stay there again. Thank you very much for your feedback. I am sorry the door was a problem at the beginning of your stay. First off no complaining about price. If bargain is what you are looking for this is the place! Oh, and it's clean. Old but clean. And another thing, the bed was good. On the negative side, it is old and desperately needs an update. That will take some money. What won't take money but will take some attention is training of employees. They were nice but both in the evening and in the morning they were distracted by guests who were interested in them. In the a.m. they let a 3rd party behind the front desk.he made several off color comments that made me feel like I was in a one-star motel. Great price, below average environment. I am very sorry you felt uncomfortable during your stay. Some guest consider this like a second home. I will address the issue. I am very sorry. I have stayed at this Best Western in Barboursville several times and I have been very impressed with the hotel staff every time. Even the lady who handles the breakfast in the morning is very friendly. I really like staying at this hotel. The rooms are always clean and quite large. Older hotel, needs some updates. The staff were very friendly and helpful. The rooms were clean and the bed comfortable. No elevator so if unable to do stairs, request a first floor room. Walking distance to some eating places. We would stay here again. "Great Hotel at Great Value"
We had the pleasure of staying here recently and enjoyed our stay. We found the rooms to be spacious and well appointed, and the beds are super comfortable. We were in a king room, which came equipped with a small fridge, coffee maker, microwave and blow dryer. Towels and bathroom amenities are generous. The hotel is showing it's age a little, but it is clean and the staff work very hard to make sure that all needs are looked after. The breakfast has a good variety and is well cared for. The only reason that I didn't give it 5 stars is because the noise from the neighbouring rooms is loud when the water is turned on. Would definitely return when back in the area. Thank you very much for your feedback. I am glad you enjoyed your stay. We stayed one night here and as usual, we get concerned with cleanliness....well, this place was clean...When we checked in the employee was very pleasant, friendly and helpful...Nice breakfast bar and the employee was on top of cleaning up and filling up..also very friendly and pleasant. Thank you for staying with us and I am glad everything met your standards. "Nice people work here and it makes a big difference." I really like the fact that everyone here is nice and helpful. I would staty at this hotel anyday over a five star with snobby staff. Thank you all for being real and also for being so sweet about my pet. Staying with relatives in the area and had plumbing issues and needed place at last minute. Best Western was some $35 cheaper than some others close by. Very nice room and location. If the need arises, would not hesitate to stay again. "If you don't mind the sounds of a submarine, then go ahead and stay here." We booked this hotel for 4 nights but only stayed 2. I was so angry because the walls in this place were paper thin. You could hear the people in the next room eating popcorn. It was ridiculous. Also, when they people in the next room turned on the water, it sounded as though we were about to experience what the people on board the Ark must have experienced. It was so loud I could hear it through my ear plugs. They also had a big group of kids and chaperones in for a sporting event. The chaperones should have been smacked because they were not supervising the kids. I called the front desk staff to complain and they apologized profusely. I felt satisfied for that night. But then it happened again the next night. I called the front desk staff and told them we were checking out because I had had enough of the noise. The staff apologized again and I told them it was not their fault. It was the fault of the owners and they were not to blame. They refunded 1 night and we went on our way. I will never stay at a Best Western again. I am very sorry you were not able to stay your full stay. I understand how upsetting the noise can be with large groups. We try our best to keep them in one section and as quite as possible. I again am very sorry. "A good value - price, cleanliness and free breakfast!" Good time had at this Best Western....room was clean, pool area was excellent and the continental breakfast was delicious and more than enough! Thank you! Air conditioner was up to par....beds were soft and clean. Toiletries were plentiful! The housekeeping staff was very friendly and very thorough! The noise level was low....The hotel is in a excellent location. "Best Stay at Barboursville Best Western"
Best Western is the best! It is clean and the price is reasonable. The employees are friendly and caring. We stay there every time we visit now. The room is arranged well for my husband that is in a wheelchair. The rooms are always clean. I bleach wipe everything and never get any dirt . Thank you so much for your business. I am glad you enjoyed your stay. This Best Western is great. The rooms are very clean and the staff are great. The front desk staff in particular are very courteous and willing to help. I will definitely stay here again. I was here on Business and needed to fax some things and the front desk personnel were willing to help me and very nice. Erica and Amanda were great. The breakfast is good and plenty of room to move around. The rooms are big too and clean. The internet worked great. Thank you so much for staying with us. I am happy you had an enjoyable stay. You are in good hands, and in a great place. We stayed on the Priceline, and we are so glad they contributed to our trip. 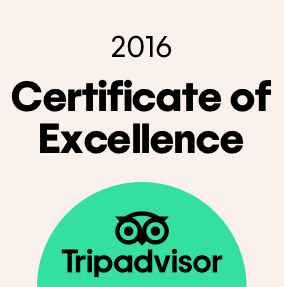 They picked the best Hotel with the best value we have ever had.It is one you will want to tell everyone about. Very friendly hotel. I was there for one night with my grandson and was quite pleased with our room. The free Wi-Fi is a plus. Complimentary breakfast was okay. There are plenty of restaurants close by if you need another meal. 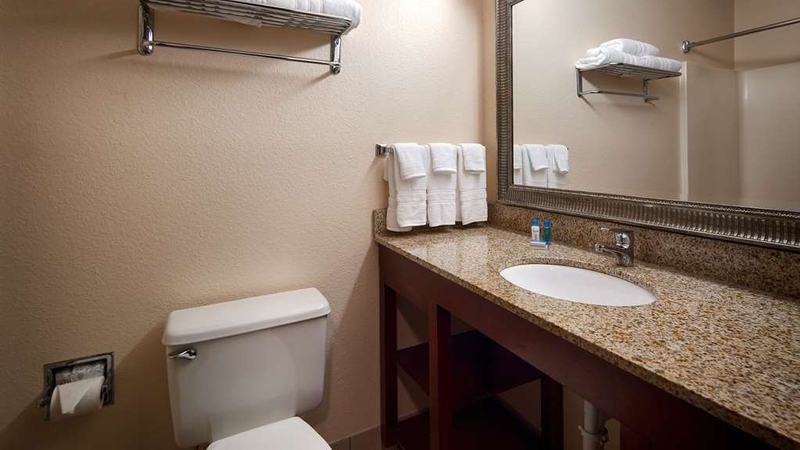 This Best Western has been upgraded with granite counter tops in the bathroom. All-in-all, no complaints. Oh my gosh! Horrible. The outside door was fixed where it wouldn't shut and lock so anyone off the street could get in. Our room stunk like it hadn't been cleaned in a month. I went to the front desk they showed me another room and it smelled like a bathroom. I demanded my money back and went across the road to the Hampton inn and suites. What a world of difference. Staff was nice.would never recommend this place to anyone! Supposed to have wifi but wouldn't work. I am very sorry about the trouble you had upon arrival. Thank you for making me aware of the issues. Adequate for a one-night stop but they should advertise that there is no elevator. Also the pillows were half sized. The breakfast was plentiful and good except the scrambled eggs. They are dry and tasteless. "Good Deal for the Money!" Just came back from spending 3 nights there. While it's true the hotel could use a little updating, we had great service from both the day and night desk people. They are very knowledgeable about the area. Shopping, restaurants, even apartments, for someone who knows nothing about the area. The wifi worked just fine, just the office center computers were having some internet difficulties. Despite the fact that there were 2 complete Baseball & Softball teams staying there the hotel was quiet after 10 and still neat. The Breakfast room certainly got a workout and by the time we got there at 8:30 most of the hot stuff was gone. The Breakfast lady did her best to keep everything filled up despite the traffic flow. There was always hot coffee and muffins. Wished it was open a little later than 9 for us vacation people. The only minus I can see is that they now use FULL size beds instead of QUEEN. Although comfortable, try putting 2 good sized adults in one of these and neither get a decent nights sleep. Why the change? A few extra inches of room on either side of the bed or the extra money for the mattresses? They are not the only hotel to downsize the beds and I have to say I don't like it! Please consider returning to Queen beds if you renovate. The outdoor pool was nice despite the heat. It has to close a little earlier because of the rooms around it. My son had a great time there. All in all a positive stay for a great price. Would definitely return there. Comfortable and quiet. Just what we wanted. Free wifi kept the family entertained. Outdoor only pool so didn't get to use it since there was a thunderstorm but the workout room had a nice treadmill. They had a nice breakfast selection too. This place was very busy. I found that the service was acceptable or not overly friendly. Desk clerk seemed tired but that is understandable. Guestrooms were clean. The betting had a few spots on it but overall seem to be acceptable. Desk Clerk was hopeful to find a local restaurant in which there are plenty around this hotel. I stayed two nights here and the place was very clean and well-kept. The staff was very friendly. It's close to several restaurants and shopping. I slept in both days and didn't get to try their breakfast so I can't comment on that... But the room was fairly spacious and comfortable. Poor first impression--2 agents at check-in and neither greeted /acknowledged me as I stood in front of them for 5 minutes. Check-In was speedy and efficient. I was given a room on the 2nd floor and discovered that this motel (which appears to have been built in the 1970's) has no elevator. Having dragged my bags up to the 2nd floor I was greeted by a hallway with tattered carpeting and a paint scheme ala Creech Brown. The room itself was, thankfully, clean and well appointed with a fridge, coffee maker, and microwave. The double bed had clean linens and 3 pillows. 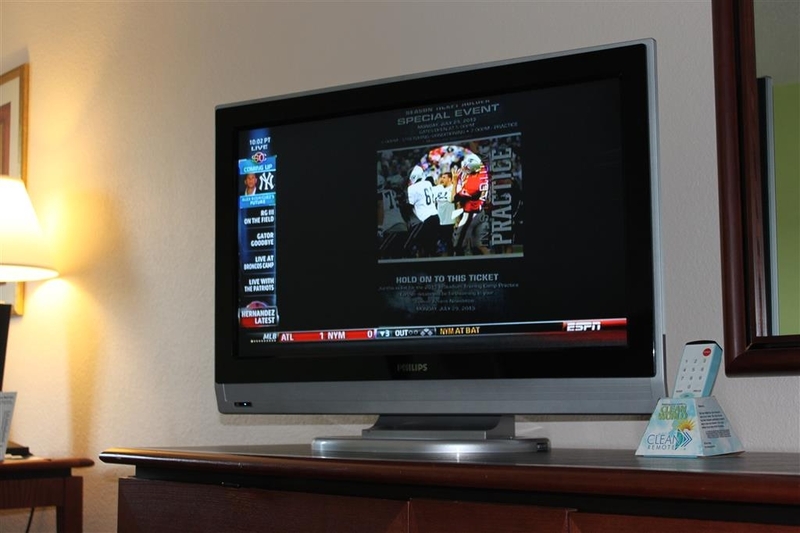 The 32" flat screen did not have any HD channels and the SD channels were very grainy. I am very sorry to hear about the problems you had during your stay. Thank you for letting me know. I am very sorry about the problems you had during your stay. The hotel staff were caring, efficient, courteous and friendly. We had a good sleep due to: quiet air condition, good pillows, soft beds but preferred firm beds. The TV channels were great with so many choices. Breakfast was good but fresh fruits were not available. The outdoor swimming pool was good but would be better to see a drinking water (fountain). Internet connection was reliable and fast. Pitcher of water was not enough near the breakfast area. We would love to see a water dispenser or filtered water machine. Don't let the overall appearance deter you from this hotel. It's location is perfect for travelling and isn't expensive at all. We found a coupon in the travel book and got in at a reasonable rate. Breakfast wasn't over the top but was adequate. For the busy location it was actually very quiet. Breakfast was excellent, but the stairs needed to be swept. There was no elevator. My room and bathroom were clean. This is an older hotel building which might account for the feeling that it was not quite as nice as most Best Westerns I have stayed in. I only stayed overnight on my way to Virginia, so perhaps my rating would be higher if I stayed longer. I am very sorry we did not meet your expectations. Arrived & our room's AC wasn't working. They immediately moved us to another room without hassle. Both rooms were clean & nice. The breakfast was a typical continental breakfast. The staff was friendly and neatly represented themselves and the hotel. No complaints?? I am sorry the AC was not working. I am glad to hear the problem was immediately taken care off. Thank you for your business! Clean, comfortable, great AC, very attentive staff, appears a good value. Like it better than the local Econolodge we stayed in last visit. Pool looked awesome from our room but no time to enjoy. Breakfast area was very busy yet staff kept it clean and stocked, much better than I expected, and much better than most "free" breakfasts. Thank you! I am glad to hear about the breakfast! This hotel is surrounded with many eating establishments, some just a walk across the parking lot. Room was neat and functional with a refrigerator and microwave. Did not use the pool. Breakfast had a good cold and warm variety of food and was presented well. The property is a little dated in its decor but clean and well maintained. Staff struggled with the computers at check in but all-in-all were cheerful. It was a good value for the money when compared with the competition and that is why I came back a second time. "Nice for an over night stay"
Room was very clean. Staff were very nice and helpful. Would stay again. It is only a short ways from Huntington Mall and plenty of places to eat. Easy access from I64. Very quiet. Beds very comfortable. 3 pillows on each bed. Bathrooms very clean, with plenty of towels, shampoo and soat. I only stay at Best Western. The rooms are nice. Always clean. Service is great. Always enjoy the breakfast. Great Coffee! I always sleep good because the beds are nice and comfy. Overall a great place to stay. It is unusual to stay in a motel with no elevator. Not being able to obtain a ground floor makes it very difficult to climb with bad knees .I just wanted to make a statement not dwell on a number of items. I am very sorry. I understand how difficult it can be without an elevator. Been staying here for quite a long time due to an extended business need to be in the area. I couldn't ask for a better staff that is freindly and attentive. Very pleased to be here and feel grateful to have this hotel available for me. Anna and the staff are superior and top notch!! Thank you very much. We have enjoyed having you! Check in could have been better. Staff was not willing to cooperate with the rewards program. The pool was excellent, food was good. The rest of the staff was excellent. The only other problems I encountered was the amount of noise coming from the showers in other rooms, and room was not cleaned one day. I am very sorry. I wish I knew what happened with the rewards program. The price for the nonsmoking room for the night was great. The issue is the nonsmoking rooms smelled like smoke. For this reason, I give the rooms a poor. The nonsmoking rooms and smoking rooms need to be better separated. I am very sorry about the smell. We are working hard to get the problem resolved. Bad odor when entering from the back.. No elevator. Decent breakfast. Noisy in the room. Hard to get extra towels. Great location for food and shopping. We didn't expect the Ritz Carlton for the price but expectation were not met. I am very sorry you did not have a good experience at our location. We stopped here while traveling. Our room was on the 2nd floor. There is no elevator at this hotel which was hard for my dad with knee trouble. We were unaware that there was no elevator beforehand but it was late in the night. The beds were real comfy. It was a quiet clean room. The breakfast was ok, about average. But eggs tasted like they were frozen and then heated up. Check in and out went smooth, staff seemed friendly. It was a good place to stay for 1 night while traveling. Only paid about $67 with our aaa rate which was really great. I understand how difficult it can be for someone people to walk upstairs. I do apologize. "good price but non smoking room over smoking room"
We got a good price. Unfortunately, smoking rooms below us made our hallway stink. If you are very allergic, you don't want to stay here because the non smoking room did smell a little like smoke. The carpets looks pretty old but the staff was very nice and the bathroom and beds were very clean. I am very sorry about the smoke coming into the halls from the smoking section. From our first-floor unit, the loudness of another guest's shower running was atrociously loud. Also heard TV, doors slamming, laughing, voices, and hairdryer. At 5:00 AM, their alarm woke us up. I would recommend trying another floor if you're planning to stay. It's well-located. Breakfast was good. I am very sorry about the noise from the other rooms. I understand how upsetting this can be. I was satisfied with my stay this time. I probably will look for a Hotel with an elevator the next time I come through. I am single and I was initially given a room on the second floor. I explained to the clerk that I had heavy luggage and a heavy cooler that I could not carry upstairs. She offered to help me carry them, but there was a kind guest checking in a the same time as I was who offered me his first floor room. I don't like to inconvenience anyone. Otherwise everything else this time was great. "Quality place at a great price"
We chose this hotel because the price difference between it and the others in that area was huge. We were happy to find out that this did not mean it was a lesser place to stay. We will stay there again. Thank you very much. I am glad you enjoyed your stay! "Excellent lodging without a reservation!" Not knowing where we might stay for the night after a day of sightseeing, we pulled into this Best Western based upon our great past experiences with Best Western lodging locations. To our great pleasure, we were able to be given our room next to the entrance and our vehicle. The lobby and personnel were friendly and professional and assisted us with a nearby dinner location. Our room amenities were very good and the mattress and pillows were exceptionally new and comfortable - unexpected these days in many lodging facilities. Overall rating of very good to excellent for this Best Western! Thank you very much! I am glad you enjoyed your stay. My daughter and I chose Best Western as our overnight stay to shop and spend time as her birthday gift. Room was clean. Beds were comfortable. Since we planned on shopping most of the day we arrived our stay in the hotel was minimal. Staff was pleasant. I am glad you enjoyed your stay. Thank you! We stayed two nights for a volleyball tournament in Huntington. The hotel was a short drive to Big Sandy Civic Center and very easy to get there. There are many places to eat around the hotel along with a mall and Walmart very close by. The breakfast at the hotel was very good and they made sure to refill when getting empty. The beds I wish would have been queen size instead of double but that is really my only complaint, if you want to call that a complaint. No elevator to the second floor but when I booked I requested a first floor room, so no problem there. I know some people are petty on every little thing but I really found nothing to give this hotel a bad review. The staff was cheerful and helpful. Was nice to walk across parking lot for dinner. The only problem was the music from the pub across the lot. Called the front desk and they said it would go until 2 or 3 which was unacceptable to us. They immediately moved us to back side of hotel which was quiet. Thank you. I am sorry about the music. I am glad we were able to move you. Sorry for the inconvenience. When ever going to the Huntington area, this is the only hotel I stay at, great staff, internet, breakfast. Great service. Access to lots in walking distance. I would recommend staying at this location always. I stayed at this Best Western recently. The one thing that was awkward was that the stairs to get to the second floor rooms was a bit tough with luggage. The room was good and convenient to restaurants that were in walking distance. We would have stayed there on the way home but they were sold out - overall a good value. "Clean and quiet for less"
This hotel pleasantly surprised my wife and I. Even though its physical layout is somewhat dated and there is not an elevator, our room was very adequate--clean, quiet, comfortable, and the internet even functioned well! The breakfast was the best we encountered in an entire month of staying in hotels over a 4,000 mile trip. After 7 hours driving we needed to stop, this was the only hotel available without driving further on, I wish I had driven on....old decor, poor desk service, noisy room. I was woken about 1:30am by this almighty clattering coming from the adjacent room or so I though, when I went out to investigate I realised it was the large vending machine next to the room. I went to the desk and asked them to switch it off "no can do" not sorry, "no can do", I moved rooms sleep pattern totally disrupted by this point and missed my 7am alarm, ruined my nights sleep, which in reality is the only thing a hotel has not to do, the whole reason people stay at them......and disrupted my whole day today putting me of schedule, I did ask for a refund at 1:30am this morning and was told "no my manager will be here by 2am" disgraceful service and I still want my refund. I will never stay or recommend any best western premed is on either side of the Atlantic. DISGRACE! I am very sorry about your stay. I did try to call the phone we have for you, but I could not get through. I would like to talk to you and get this resolved. We stayed at this hotel for the location. We were headed to Canaan Valley Resort, WV from West Tennessee and wanted to break up the drive, so I found this Bestwestern which was just right. There was a Mall, a Walmart, and plenty of restaurants to select from all within a mile of the hotel. The hotel staff and service were all friendly and helpful. Our room was okay and clean. The toilet was slow flushing, but not a big deal. We had a hot breakfast which was also okay. I couldn't had been any happier about the price as it was free with my Bestwestern points I had earned through other stays. I did look at the price for the room before booking and it was a reasonable rate. Housekeeping missed a pantyliner sticker stuck to the sink in the bathroom. The temperature in the room went from one extreme to the other. No elevator .... really! People are bringing in heavy luggage and you would think that this would be important. I could just picture an 80 year old man trying to get his luggage up those stairs. This is a safety issue. I am very sorry about the housekeeping issue. I have looked into it. We always try to get people on the first floor who are unable to climb stairs. I am very sorry. The staff on the front desk of this motel were extremely helpful when we arrived. The entire staff made our stay very welcoming, We were attending a funeral and the staff was helpful with helping us getting around Barboursville to the funeral home, church and cemetery. I am glad we were able to happy. I am sorry for your loss. Thank you for staying with us. This is an older facility and outside shows this. 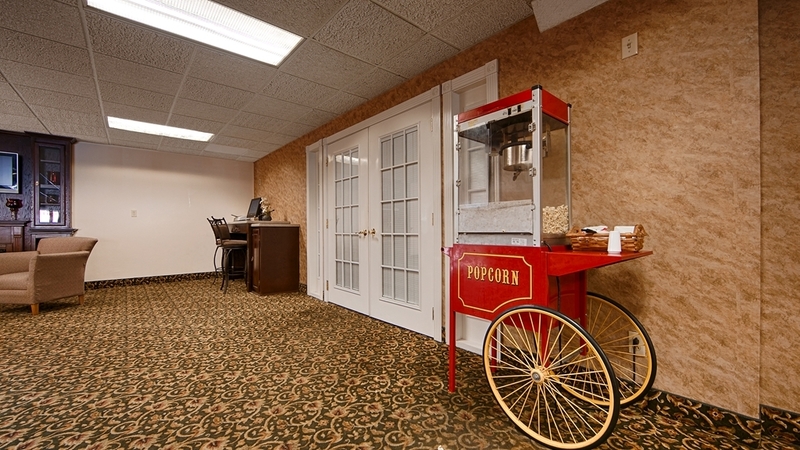 HOWEVER, rooms are remodeled, and lobby in process of being remodeled. Very nice staff, nice breakfast. No elevator - if this is an issue, ask for first floor. I'm surprised Best Western allows this property to use it's name. It is closer to a budget inn. Paper thin walls, sounded like the woman next door was in my room with me. Beds are subpar. I'm used to Best Western having pillow top beds. This wasn't even close. The Internet is slow, it was hard to get anything done. Had I an inkling of what this was like, would have driven another 50 miles to a better hotel. It's probably a good value for the money (75 rack price) but I expect better from a Best Western. "Disappointed Diamond member"
I stayed here for a whole week and it had its ups and downs. The first three days was during a major blizzard so we were completely hunkered down. Cozy bed, hot breakfast, a workout room, popcon in the lobby,and decent service. But there were a ton of distractions. Screaming matches from the room beside ours. Loud teens upstairs continuously. The room was clean mostly, just a few things that needed attention. I have stayed at this motel several times, and each time I am happy that I did. The motel is comfortable and the staff are friendly and helpful. I stayed in to eat this time, but there are a number of restaurants nearby, and it has been my experience before that the staff are able to help with finding one that fits your desires. The motel is also near the Huntington Mall for shopping. I will go here again on my next time through the area. This is and excellent hotel with all the necessary amenities. ie; any type restaurant, service station, Mall etc. the location at interstate 64 is a plus. The staff in al instances are very cordial and helpful. the price of this room and location where very nice and I will come back to this hotel when I'm in the area the people and staff was nice, kind and helpful parking was great and a lot to eat around there best place is japaness stake house kinda costly but great food. "Fine for a quick overnight stay"
Located just off the freeway, this Best Western is perfect for a quick night's stay, and is what one would expect for the price. The fridge and microwave are a nice touch, and the rooms, while being nothing special, provide you with a good rest. Hotel was clean, rooms, nice, and staff friendly. The main issue was the damp and smoky smell in stairwells, along with people smoking right outside the front doors that you had to walk pass/thru the smell/smoke. There were no elevators to the second floor that I could find. As usual my stay at this hotel was the same as my last visit back in August. I highly recommend this hotel for its location( close to several restaurants) and a mall less than a mile away and the rooms are excellent. I will definitely be staying at this hotel in the future. We stayed here coming back from Branson, MO. We were able to pick up a coupon at the WV welcome center and it made our stay most affordable. The condition of the hotel, the attractiveness of the lobby, and the breakfast room were all very nice. We would definitely stay here again. In town for football game and visit with family, so this place was in the right place to accomplish both with minimal driving. Check in was fast and friendly. Room was spacious and clean. Breakfast was more than I had expected with eggs, sausage, potatoes, juices and coffee. The only knock on breakfast is the continuous toaster is set too fast--even two passes through did not begin to color/heat the bread. But the quality and quantity of the rest of the offerings more than made for the rather pale toast. Other reviews of this property mention traffic noise, but I had a room on the highway sign and barely heard ONE truck go by--and it had a bad muffler. If in the area for similar visits, this will be the place I stay. We are big fans of this chain. Great beds and pillows so perfect I just ordered it for my home. Breakfast is decent. Coffee always in the lobby. Rooms large and comfortable. My only complaint with this one is noisy pipes. To compensate, the tortilla factory across the parking lot is outstanding. No elevator and room was quite a distance from lobby, but room was great. Bed comfortable. Temp good. Clean. Some noise but that was due to the State X-Country meet so there were many high school students there. 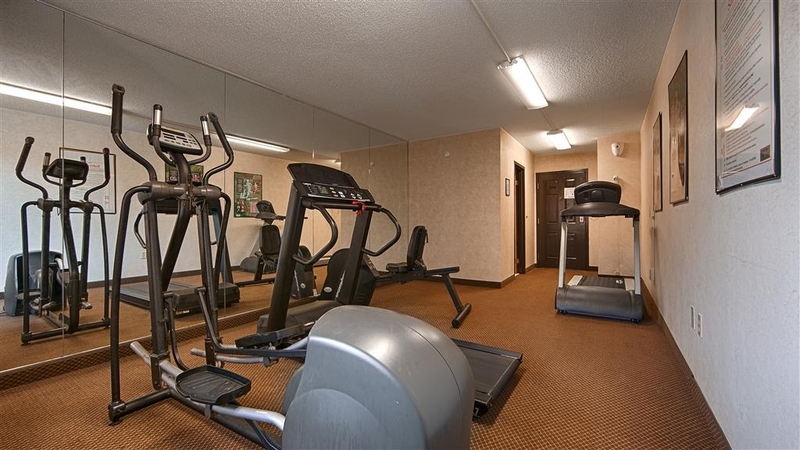 Professional staff, clean, good value, convenient location, good access to I-64, shopping and restaurants, Did not use fitness center, pool or business center. hate having to write a puff piece to get too 200 characters. "Great value, easy location off highway, Hot breakfast!" 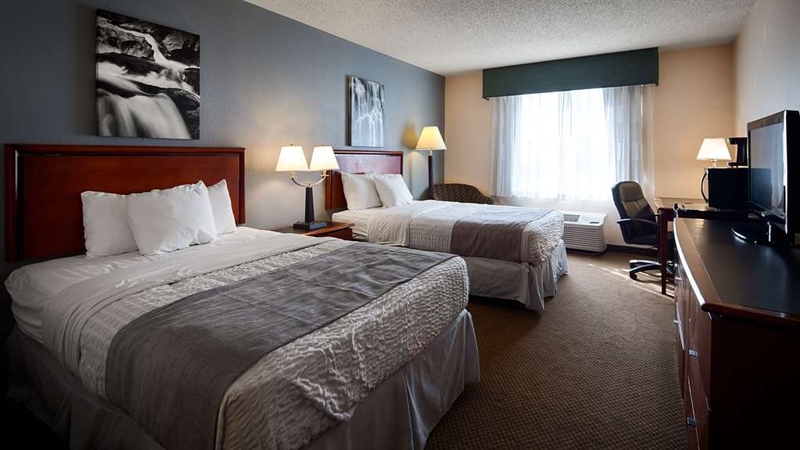 "Very reasonable and VERY clean"
$75 including taxes for non smoking room with two beds. Good hot breakfast-waffles, sausage, gravy, biscuits, fruit, juices, cereals. Clean facility. Popcorn on arrive (1 a.m.) super friendly night staff. "More Travels with our Buicks, Orlando"
Once again this hotel was chosen by location, it is a great hotel, just off the freeway and close to great eateries, the staff were polite and checked us in quickly. We asked about the location of Appliebys, listed on the webpage as being .2 of a mile, however it is not that close, so we asked about the Mexican restaurant on the lot and were told it was good. It was great, very large and busy. We stayed here on the way to Charleston West Virginia. The hotel was clean and staff were friendly. Our room was very spacious & we liked it much. The bed was comfortable. The linens & towels were fresh clean and new. The breakfast was good and adequate. The hotel is located very conveniently. Easy to get on & off from I-64. The property is in the shopping mall but it was not noisy. you can walk to restaurants in the mall. it was very convenient for us. This appears to be an older property that has been renovated to an OK condition. The double beds are just that "double beds", not queen beds, so they are OK for one person or two small people. There are no elevators for the second floor, so be aware if you do not like stairs. Hotel is close to the Hunting Mall and the Outback restaurant is across the parking lot. We stay here while traveling from NC to St.Louis several times a year. Clean, well maintained & convenient to I-64, restaurants & shopping center. A good Value, consistent quality friendly staff who are always helpful. "Can Tell a Book by the Cover... thankfully"
First impression from the outside was... Maybe we would look elsewhere... Think we were the only SUV / car in the lot as the lot was full of tractor trailers and pickup trucks. Exterior of building was bit shabby and hallways are in need of a makeover. However, once we opened the door to our room, we decided to stay. Room was clean, quiet, beds comfortable and this BW is pet friendly... However, area with grass to "walk" your dog is very limited; no "poop" bags available and trash can for them was overflowing... result ... other dog owners left lots of poop in the limited grass area outside entrance D. Apparent lack of maintenance on the part of management on the exterior.. including trash and cigarette butts. Lots of choices for dinner in the area. After a long drive it was nice to be greeted with popcorn and a smile. The room was clean and spacious. Loved that it was within distance from several restaurants. The morning breakfast was a true hot breakfast and continually refreshed. This hotel was clean. Bathroom clean . whole place looked a little worn. This place is just off I64 and in the heart of a large shopping and entertainment area. Had a room at the rear so no noise problem. Strange parking rules. You must park only in spaces that belone to the hotel. They are well marked. Signage is quite clear about this. Parking for nearby shops overlap in the lot. Good free breakfast. Lots of working men at breakfast. Looks like they may be weekly. Had to walk up stairs to 2nd. Floor. No sure but I don't think there was an elevator. If that makes a difference. Over all not that bad for an overnighter. Price under$ 100.00. Lotst of food nearby. Employees went above and beyond for my stay here. Clean and comfortable rooms. Internet was good. Breakfast was great and the lady was very helpful. The staff told me about a $25.00 gift card if I come back to stay. Clean well kept rooms. Good breakfast. Friendly staff. They have guest laundry (two loads washing and drying was only $6) and an exercise room. Located near good restaurants. A big mall and movie theatre just down the road. What more could you ask for! Plenty of parking available for cars up to 18 wheelers. I will definitely stay here again if I find myself in the area. 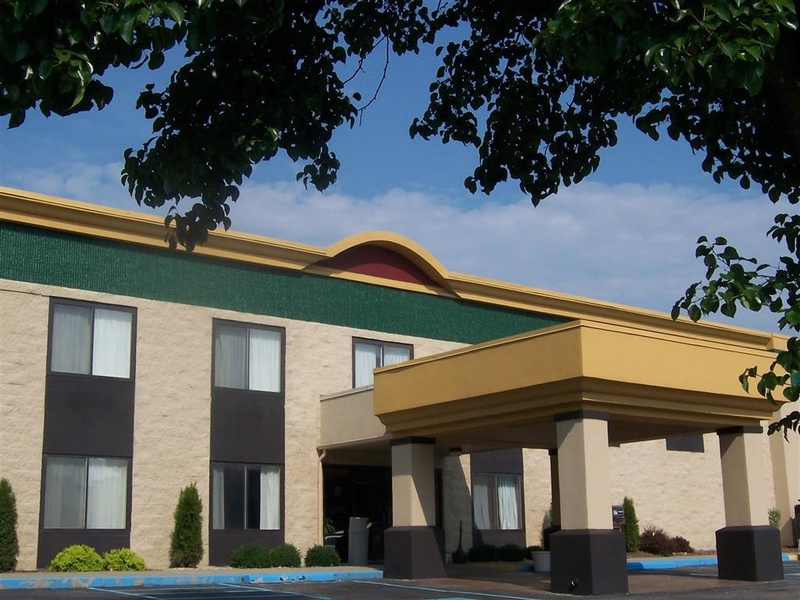 "Best Western, Barboursville, WV close to Mall"
Very nice, economical, good amenities, great breakfast, beautiful rooms, nice employees. We like this much better than Holiday Inn. Wonderful location close to restaurants, Wal-Mart, mall, interstate.